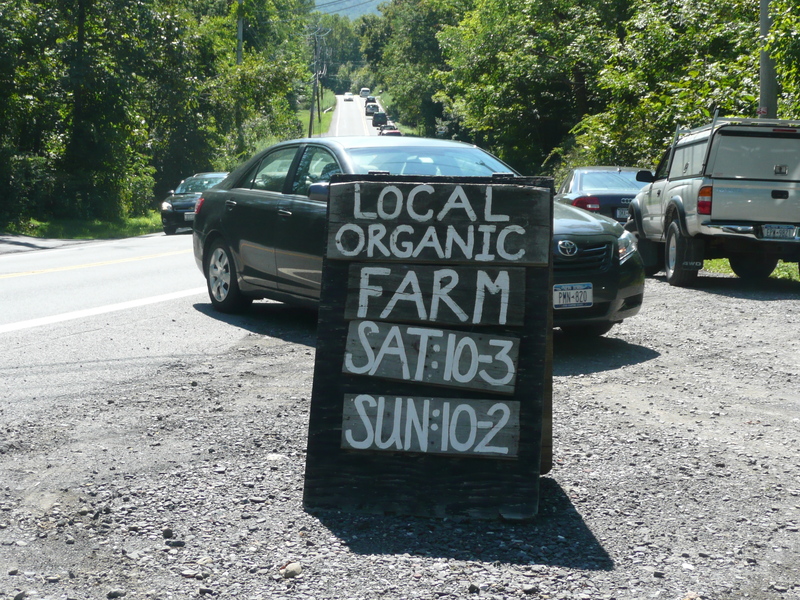 This post is the follow-on to my On the Road: Farm Stands of Hudson River Valley. Usually these On the Table posts follow more quickly, but summer’s over and the needs of Frog Commissary and getting ready to promote At Home through the coming holiday season have made it harder to find writing time. Posts are best viewed on the blog site. If you are not viewing this post there, just click on the title above. On the blog site you can also access all back posts — nearly 200, and the blog library of more than 100 recipes. 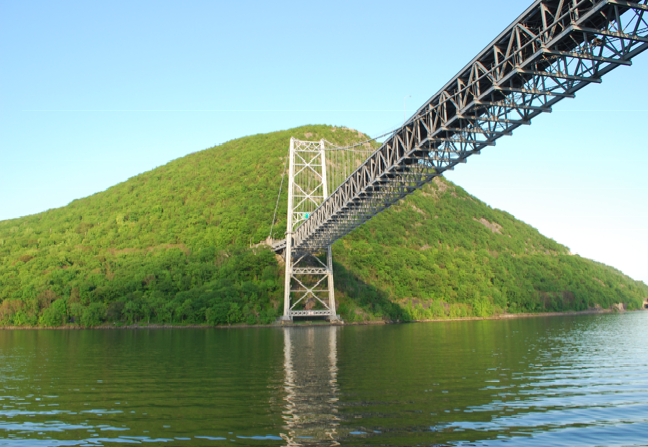 My home away from home for my Hudson River Valley trip was the home of my brother-in-law Larry. Larry, who is also our Frog Commissary Director of Operations, still has a home in Tuxedo, NY, where he lives when not at our The Franklin institute headquarters with his wife Susan and daughter Sarah. Our plan was to meet Saturday morning to continue shopping at a few of Larry’s well-cultivated Hudson River Valley haunts. We would begin cooking together Saturday afternoon and evening in preparation for Larry’s Sunday birthday lunch. You don’t get to pick your brother-in-law, but if I did, I’d pick Larry. We share several passions that include both loving Christina — my wife and Larry’s sister…and food. Larry is a wonderful cook and actually more a “foodie” than me. I do it and eat it whereas Larry does both those things, and also studies it. If I was the Slumdog and was down to my last “phone a friend” for my million and the subject was food, I’d call Larry! Included in At Home’s recipes are several recipes from a select group of friends and family and include Larry’s Sausage Stuffing. After passable meal dinner in Beacon at the end of my Friday excursion and an uneventful night’s sleep in a blissfully unremarkable hotel — the name of which I cannot recall, I headed south to rendezvous with Larry. Larry’s plan was to take me to Blooming Hill Farm and Fleisher’s Meats. This unremarkable sign by the side of the road in Blooming Grove was something akin to a faded photocopy on a pole near the Louvre announcing “Mona Lisa –> this way.” Larry had mentioned Guy Jones, the social activist and pioneering farmer behind Blooming Hill Farm. 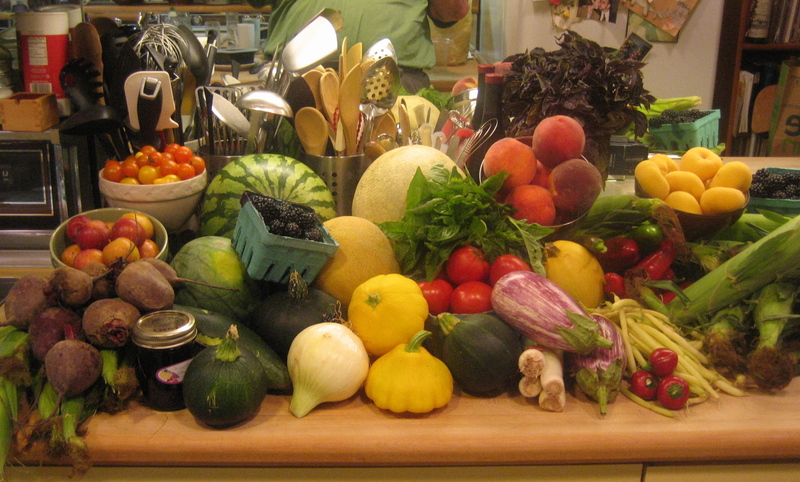 But nothing had prepared me for what was by far the finest farm stand of my long summer of farm stands. I will not write much about Blooming Hill here. My visit to Blooming Hill, and the farm dinner we attended Saturday evening, will be the second to last post in my On the Road Farm Stands Series within the next few weeks. 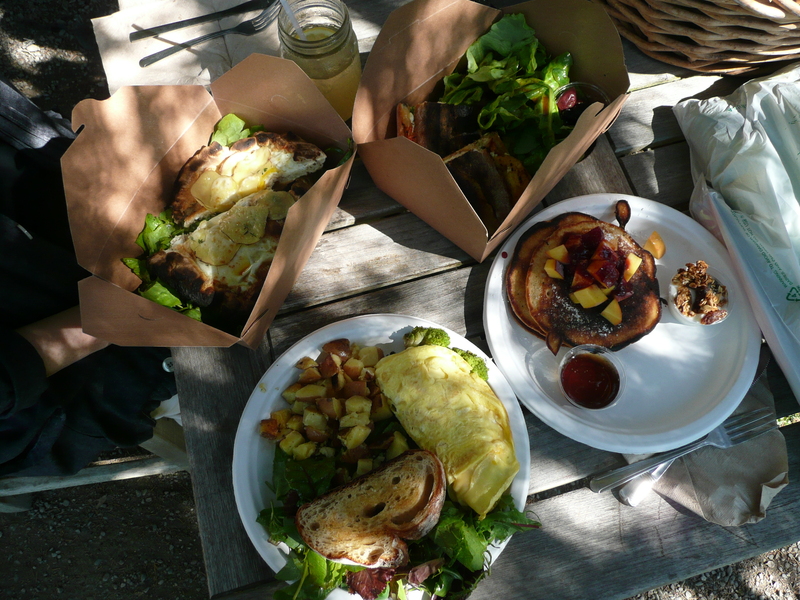 Blooming Hill is the first farm stand that I visited that included a small commercial kitchen and wood burning oven. Larry’s wife Susan joined us for an outdoor breakfast that included sourdough pancakes with peaches, plum sauce and yogurt, a broccoli & cheddar omelette with home fries, panini with ricotta, grilled zucchini, cherry tomatoes & caramelized onion and a frittata. Pretty good way to start the day. For Larry’s birthday I had Padron peppers shipped from California as they are such a treat. I had never seen them at any of the hundreds of farm stands and farmers’ markets that I visited this summer so California it was. But there they were at Blooming Hill. These Padron peppers would be an accent in the squash soup we had that evening at Blooming Hill’s monthly farm dinner that we decided to join. 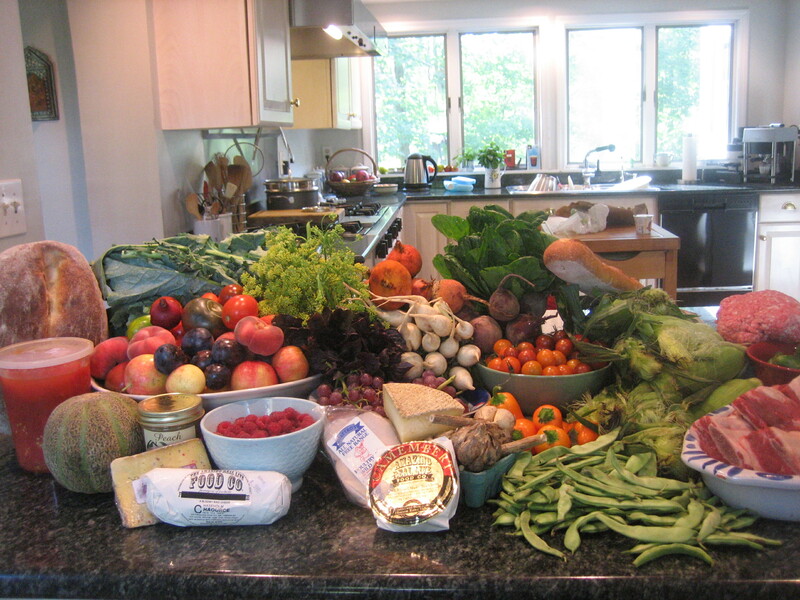 Each month Guy invites a chef to prepare a multi-course vegetarian dinner. Saturday evening David Gould from Brooklyn’s Roman’s restaurant was preparing dinner. Gould’s squash soup was the culinary highlight of the summer. The next weekend I would make this squash soup for my brother Fred’s birthday after my South Fork of Long Island trip. I will feature my rendition of Gould’s soup for you in a recipe post paired with my Blooming Hill post. Next it was off to Fleisher’s Meats in Kingston, NY. That’s not Fleisher’s Meats in Kingston pictured above. Rather that is Fleisher’s Meats in Brooklyn, NY circa 1901. The early 20th century Fleisher’s was opened by Wolf Fleisher. The 21st century Fleisher’s was opened by Josh and Jessica Applestone in 2004. Josh is Wolf’s great grandson. Those more foodie than me — like Larry — know that Fleisher’s is a 2010 Martha Stewart Tastemaker. Josh writes The Butcher Blog for Saveur Magaizine. As far as Josh knows, his modern day Fleisher’s is the only butcher shop that sells only local grass-fed and organic meats and poultry. Their business is both retail and wholesale to well-regarded locavare restaurants. On the retail side they also deliver to New York City. Larry and I decided we wanted to grill, but something more interesting…and less expensive than the highly marbled aged sirloin steaks. Barbecue was more what we had in mind which is not really grilling. Some really fat beef short ribs caught my attention and so we had our meat for tomorrow’s lunch. This choice would present a problem as it was now well into the afternoon and we were far north of Tuxedo and we had decided to go to the Blooming Hill farm dinner that night and…I had to first braise these big suckers and make a barbecue sauce from the braising liquid…all before we headed to dinner. So much for one relaxed hour!!! We added a pound of ground beef and bacon — how could we resist something as decadent sounding as ground beef and bacon. To be clear, that’s ground beef with ground bacon mixed in. These sinful future little burgers would become our hors d’oeuvres sliders. The need to by-pass a serious traffic accident southbound on the New York Thruway caused us to scurry through back roads back to Tuxedo. Pictured above is the combination of my Friday farm stand purchases and our purchases from our Saturday “supplemental” shopping. Between Saturday afternoon and Sunday, with time-out for our farm dinner, this was transformed into Larry’s Sunday birthday lunch. Christina, her mother Ginny and other brother Mike rushed up from Philadelphia early to join us for the Blooming Hill farm dinner and, of course, for Larry’s birthday. Our narrow apartment kitchen at home is perfectly efficient and built for one. It does not lend itself to in-kitchen snacking, drinking and schmoozing. Larry and Susan’s kitchen, on the other hand, is the epicenter of their home entertaining. Our mostly room temperature hors d’oeuvres were laid out on the kitchen counter. 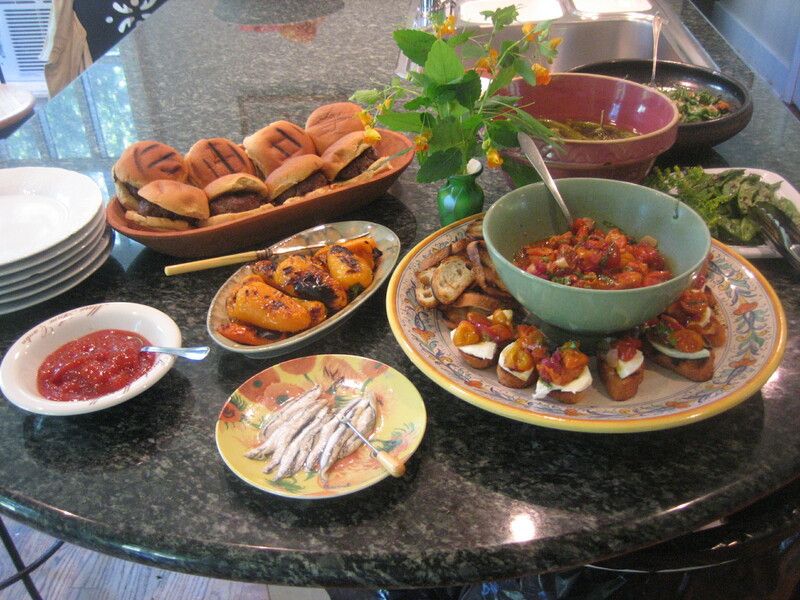 They included counter-clockwise from center: the wonderful Spanish white anchovies — Boquerones, that are an entertaining staple at Larry and Susan’s table, lightly roasted little tomatoes with fresh mozzarella on crostini, grilled flat beans, sautéed Padron peppers (the one’s flown in from California), pickles, grilled sweet peppers and the ground beef and bacon sliders — ketchup on the side. Coach’s Note: This meal is not something I would suggest you try at home with limited time. My plan was a leisurely Saturday afternoon and evening of cooking and good wine. We would do some finishing Sunday after spending time with the Sunday New York Times. This is not how it worked out. I had not planned for the long excursion north or the Thruway traffic south and certainly not the last minute decision to attend the farm dinner. Preparing all this was hurried, harried and stressful. Everything I advise against. As Sunday noon approached, having been at it without rest for some hours, I was repeatedly asked by a family member I will not identify, “When are we having lunch?” It was as if a party of seven wanted to know when there table would be ready. Not the most relaxed cooking I have done — akin to a particularly hard night I remember at City Bites cooking on the line many years ago. This was the price I paid for going to Blooming Hill for dinner…and I’d do it again! I made the these quick pickles Sunday morning — inspired by the pickles served Saturday night at Blooming Hill, using fennel flower and heirloom garlic from Blooming Hill. 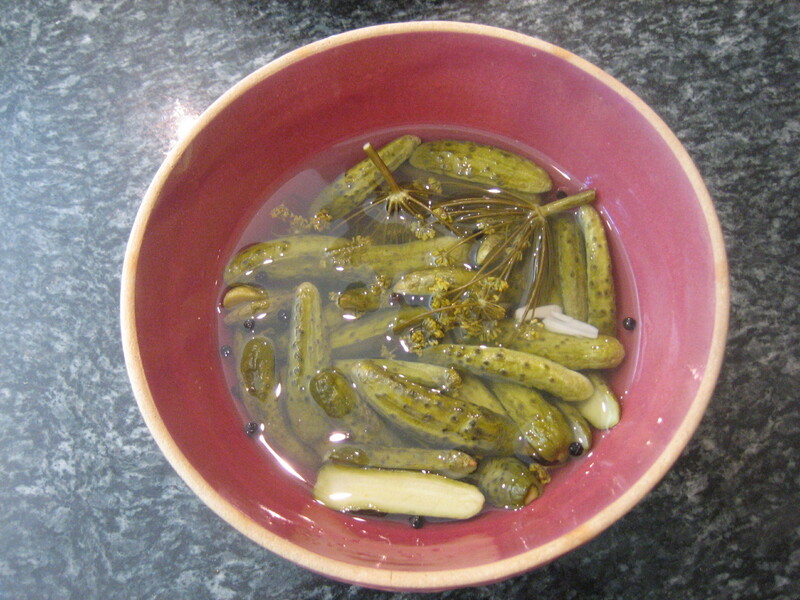 There is a blog recipe for Quick Pickles in the blog’s recipe index. This was late August and I encountered all manner and color of small tomatoes. Even though there was to be an heirloom tomato salad with lunch, you can’t have too many late August tomatoes. 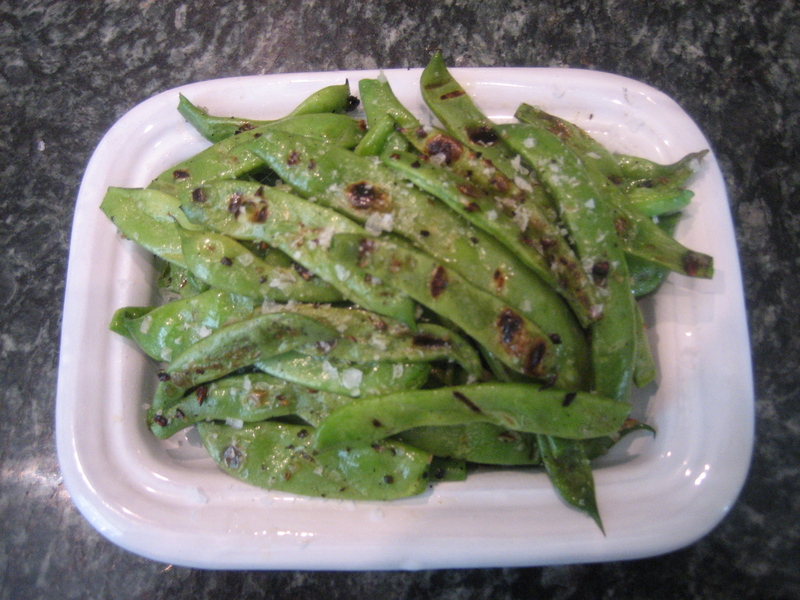 These broad beans were blanched, tossed with garlic and olive oil and lightly grilled and finished with flaky sea salt. There is a recipe for Grilled Green Beans in At Home. 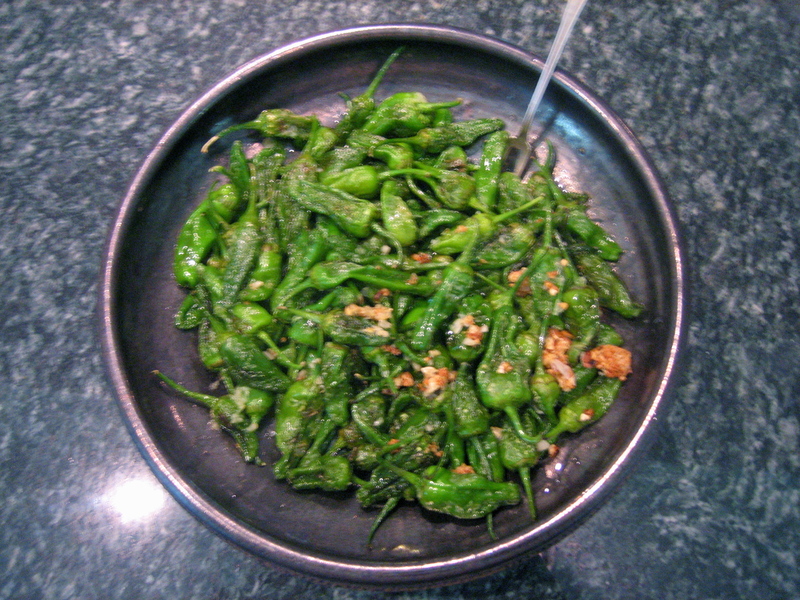 Here’s a bowl of sautéed Padron peppers. I have also written a post about these peppers. I am having a dilemma about cooking these peppers. First, it always seems to take longer for them to puff up, lightly brown and shrivel than I expect and I have to remind myself to be patient. Second, I like them with some garlic, but you can’t add the garlic in the beginning because the garlic would burn, but when I add garlic at the end, it immediately browns and sticks together. 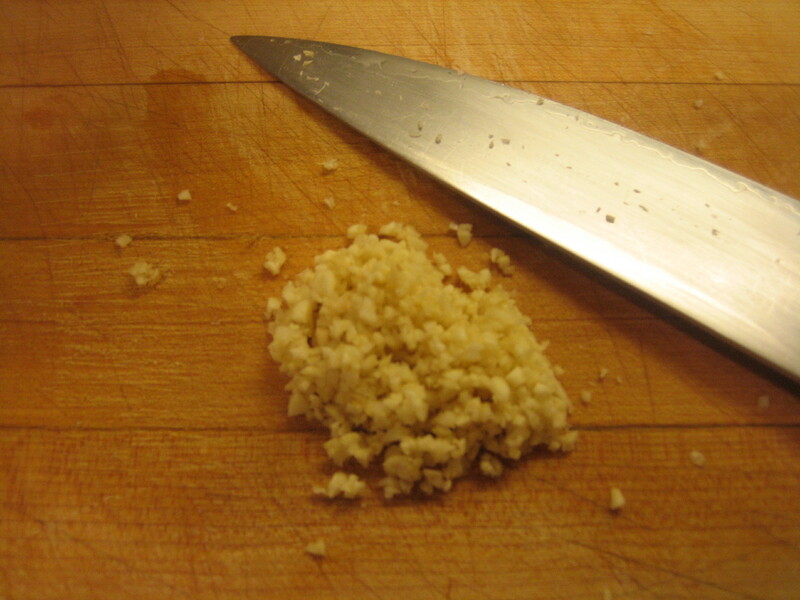 While these clumps of browned garlic taste wonderful, garlic does not effectively infuse the oil and peppers. I could cook some garlic in oil and remove the garlic before I cook the pepper, but that feels like more trouble than it is worth. I just received two pounds of Padron peppers — probably the last of the California season. I will try again. My plan this time will be to take the cooked peppers off the heat, allow the oil to cool down a bit and toss garlic into the peppers while the oil is not so hot as to immediately brown the garlic but still hot enough that the garlic cooks, mellows and infuses the peppers. Cooking is an art…though I know there is a science behind this technique issue. Late August is also pepper bonanza time and since the grill was stoked, we grilled rather than roasted these beauties. As Larry grilled our little ground beef and ground bacon sliders outside, I grilled the our potato flour slider rolls inside on a grill pan. 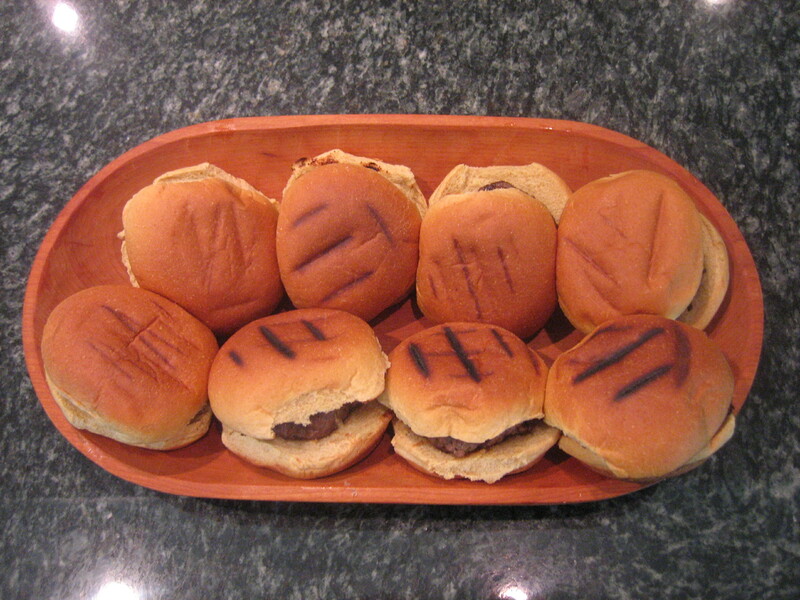 Grilling rolls — especially soft burger rolls makes them so much better. Making medium rare burgers requires a grill-cook’s attention so it’s handy to have a partner to handle the roll toasting. Following our hors d’oeuvres grazing in the kitchen, we sat down in the dining room to a plattered, family-style lunch. Most everything was at room temperature. 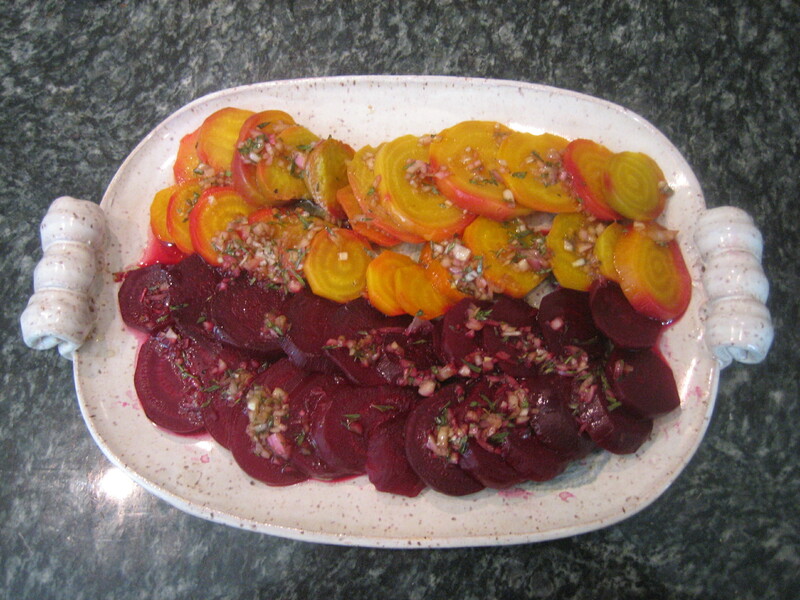 Above are beautiful red and yellow beets that were simply roasted while sealed in foil – essentially steamed in their own moisture, peeled, sliced and dressed with diced red onion, chives, red wine vinegar and olive oil. I collected a rainbow of heirloom tomatoes on my Hudson River Valley farm stand jaunt. This platter is a bit more crowded than I recommended in my post about plattering heirloom tomatoes. 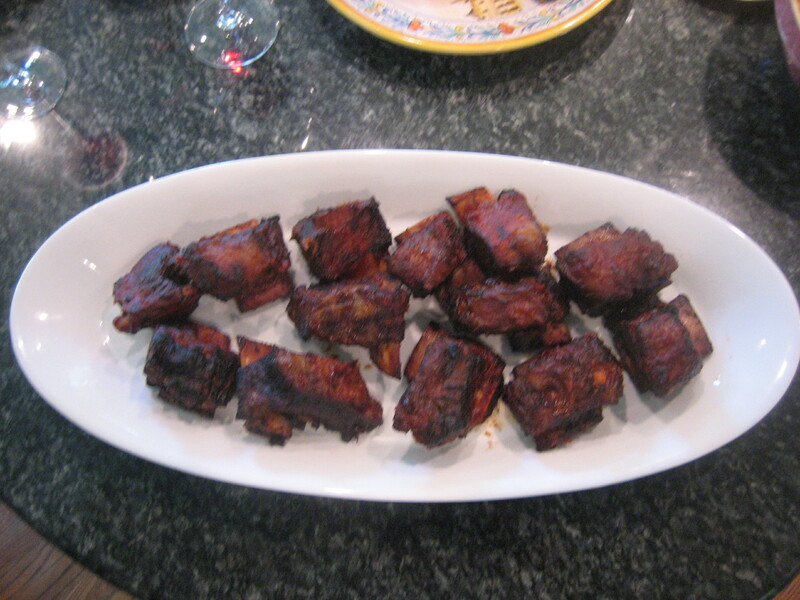 This photo does not do justice to our barbecue beef short ribs. They were big — but in my rush to get them done Saturday afternoon before our farm dinner I did not let them cook long enough and they were a bit tough. That was a shame as Fleisher’s meat had a wonderful flavor. But it’s just a meal and hardly the end of the world. I’ll make them better next time. 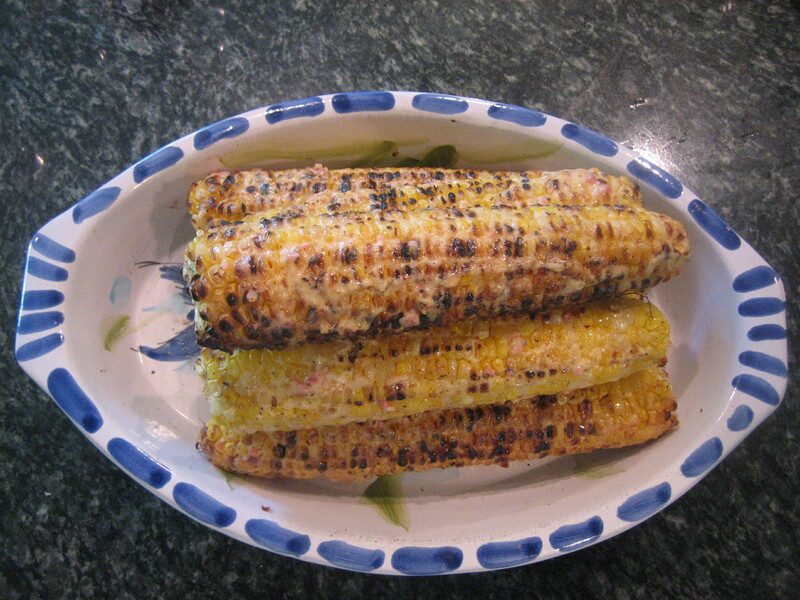 Our grilled corn was inspired by corn that I had at Greensgrow’s Farmers’ Market in Kensington. The corn is slathered in a mix of butter, mayonnaise, lime juice, red pepper flakes, ancho chili powder and salt. Delicious! Dessert included great Hudson River Valley cheeses. 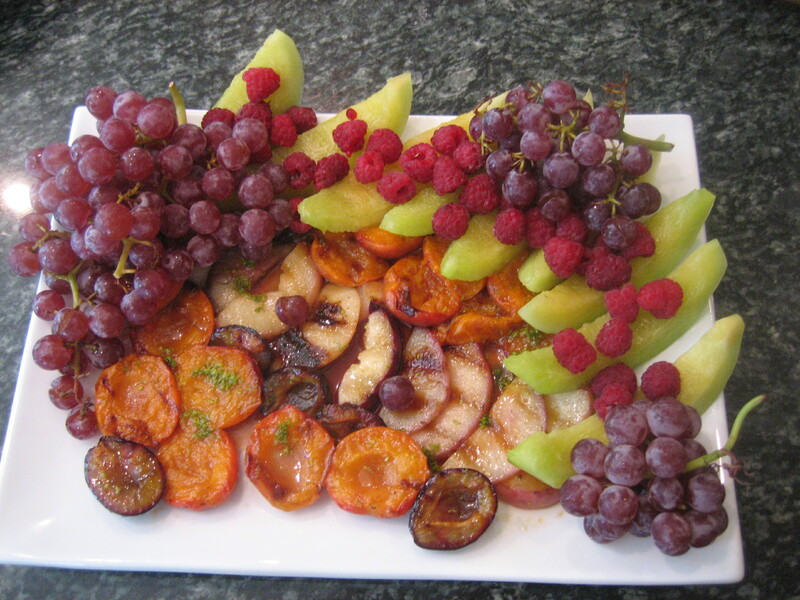 And Hudson River Valley fruit that included an heirloom melon, raspberries, the best red grapes I ever tasted and fennel and honey grilled apricots, plums and white doughnut peaches. I infused the fennel flowers by heating the mix of honey and fennel flowers in the microwave before basting the fruit with honey and a little olive oil. I also grilled the fruit on a grill pan rather than the outdoor grill. On the grill pan you do not have to worry about the fruit falling through the grill grates. 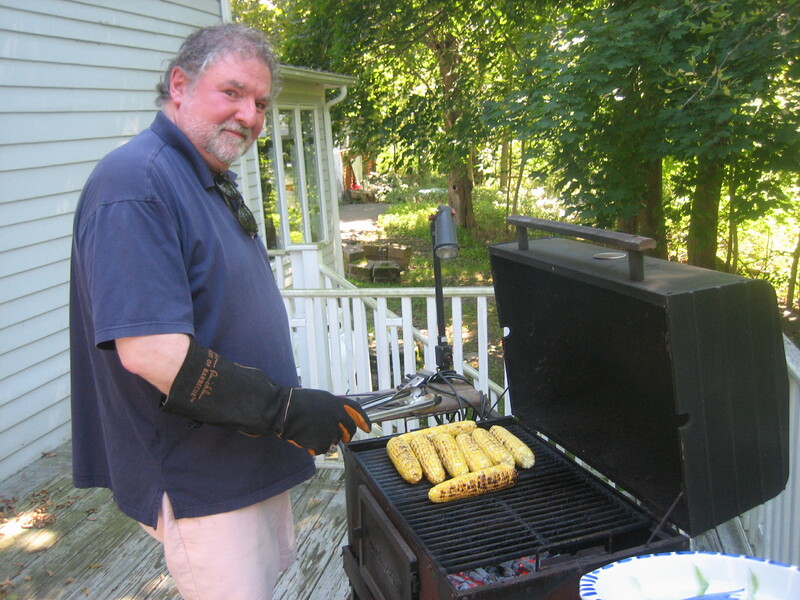 This is my brother-in-law Larry at his grill working on the corn. Naturally, Larry only uses hardwood charcoal. 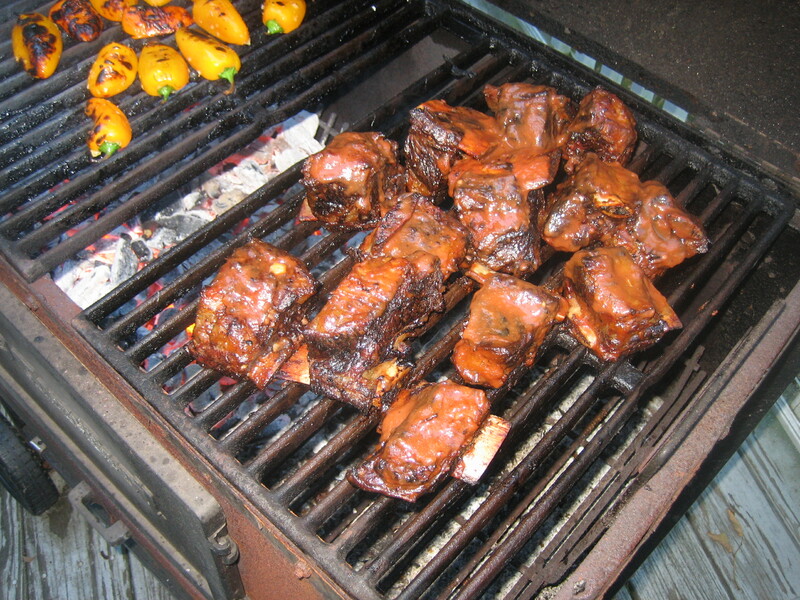 The beef short ribs were fully cooked as all ribs are before glazing. In the background are the small sweet yellow peppers. 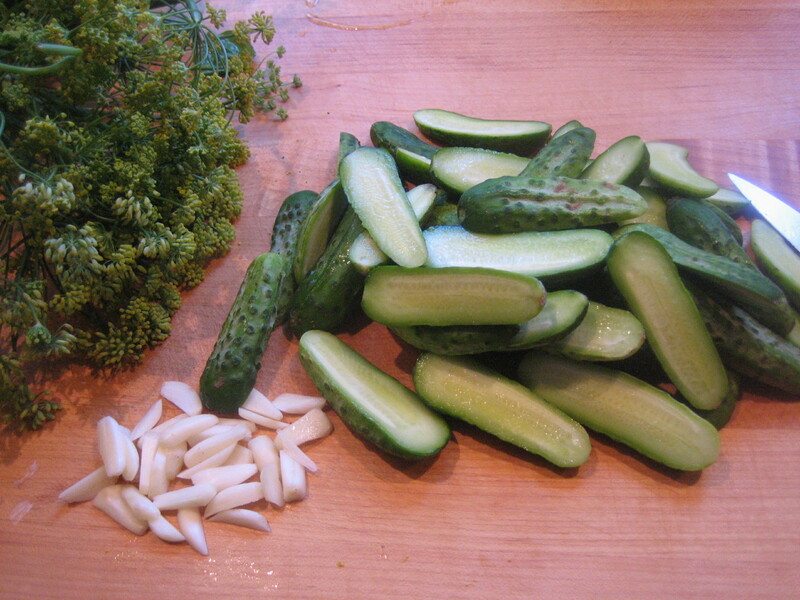 Key pickle ingredients — little Kirby cucumbers, fennel flower and garlic. Part of the farm stand adventure is that I never know what I will end up making when it’s all over. It’s like buying lots of puzzle pieces and when I’m all done, figuring out how to put the puzzle together. This is sort of like when they give those Iron Chefs ingredients and tell them to start cooking…quickly. Except my way has far better scenary, more fresh air and usually less stress. Also, the food is usually pretty good. When I started my Hudson River Valley farm stand tour, I had no plan to make pickles — though I am a big fan of pickles of all sorts. But somewhere along the line I saw these tiny Kirby cucumbers — about the size of a big thumb. They just sort of called out to me. Likewise the garlic. Adjacent to the path leading down the hill to Blooming Hill’s farm market was a wide plot of fennel flowers — also for sale in the market. I am a big fan of fennel. The Guy Jones served pickles at the farm dinner as an hors ‘doeuvres. I started by cutting garlic into slivers and after giving the cucumbers a quick scrub, cutting them in half. 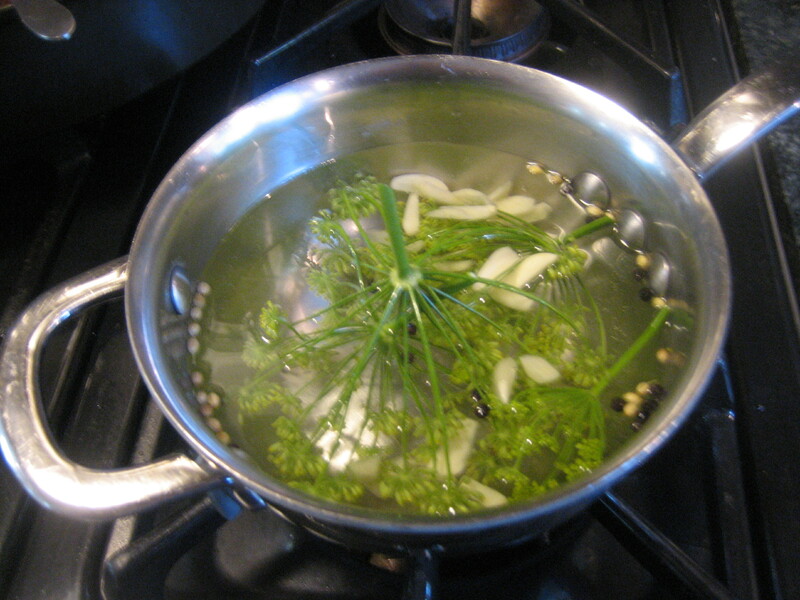 I made an infused brine with white vinegar (depending on the pickle you can use other vinegars), sugar, salt — but not too much salt, some black peppercorns and coriander seed, garlic and fennel flower. This steeps over very low heat for about 15-20 minutes. It could be longer but as we know, I was in a rush. When the brine has picked up the flavors, I increase the heat until the brine approaches a boil. 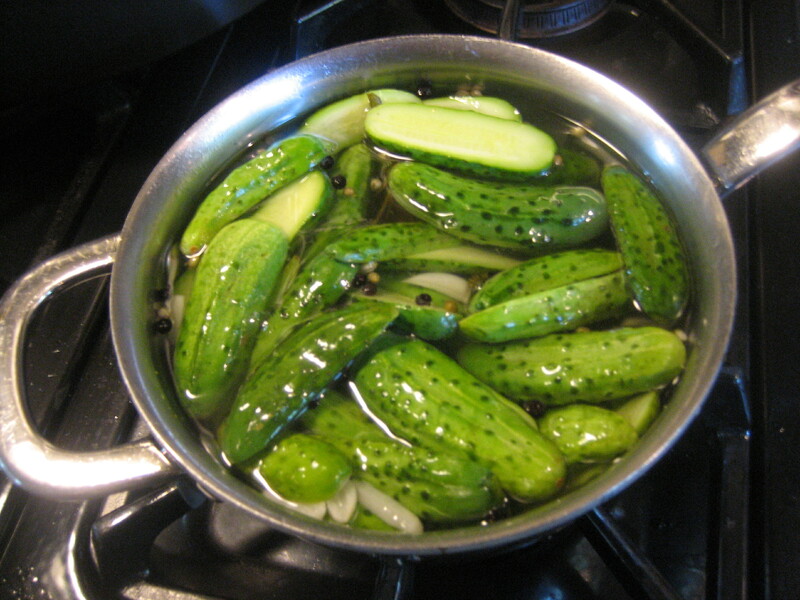 I off the heat and add the cucumbers or pour the hot brine over the cucumbers — either way. Once it cools, I transfer to the refrigerator. We ate most of them a few hours later, but they can happily sit in the refrigerator for a month. They loose a bit of crispness, but are still great. Serve chilled. 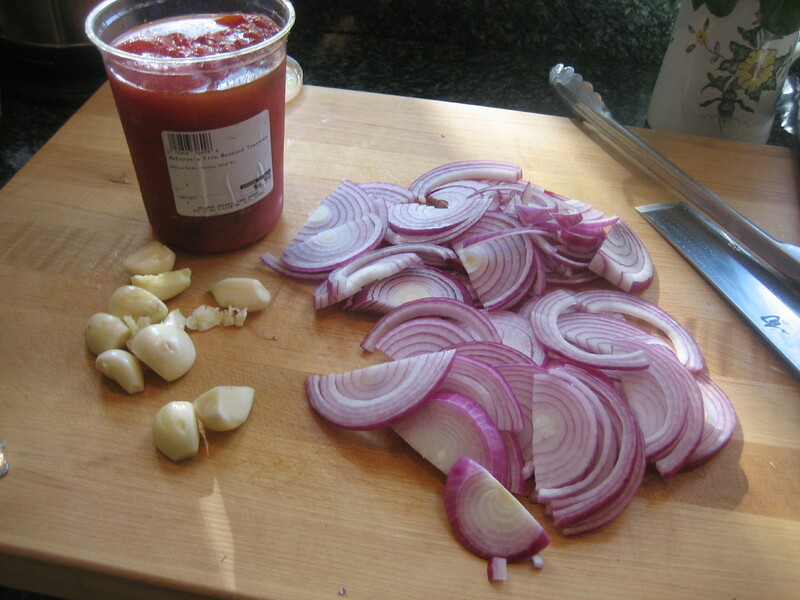 Cut tomatoes in half and combine with thin slivers of garlic and thin-sliced red onion. Lightly coat with good olive oil and roast in 350 degree oven until tomatoes just begin to soften and “melt” – maybe 10 minutes. Remove from oven and allow to cool. Add salt and pepper. A Short Course in Braising Short Ribs of Beef. 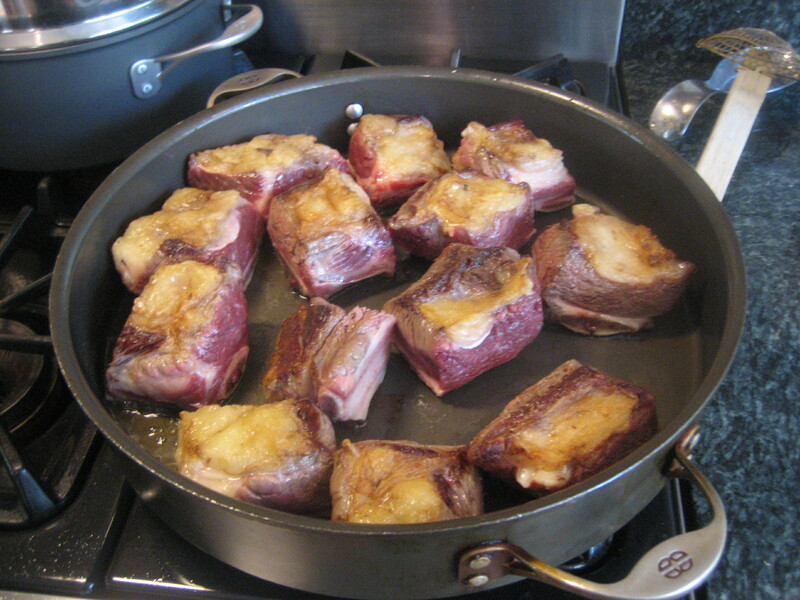 For a complete explanation about braising, there is a two-page “Mastering Braises” on Page 228 of At Home. 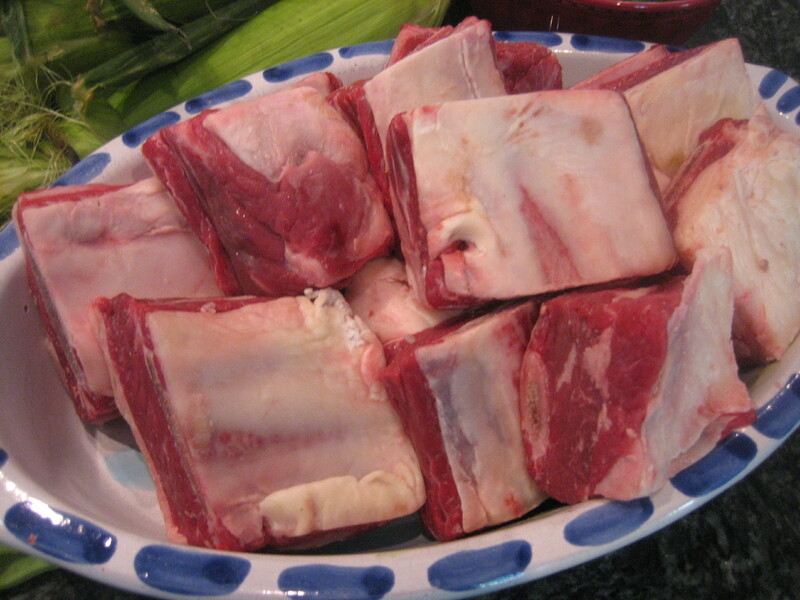 Make sure the short ribs are well-dried. I use paper towel. 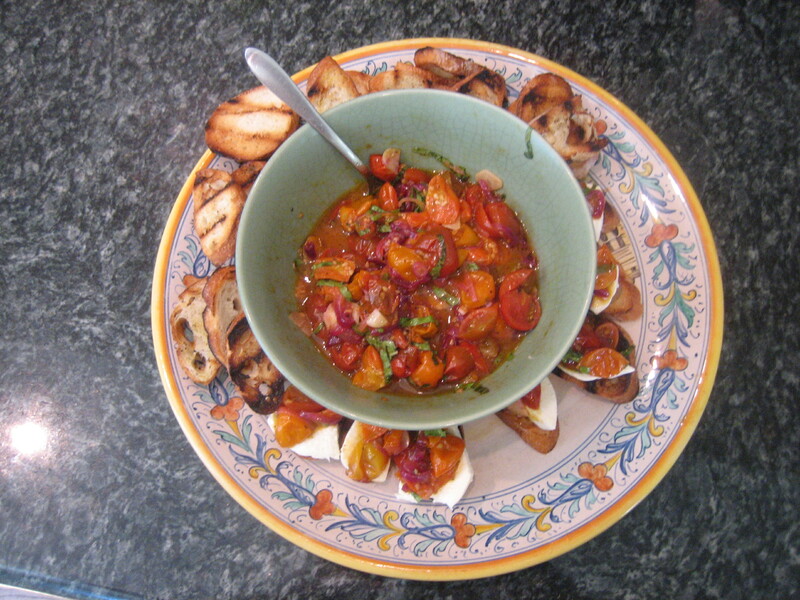 Here’s sliced red onion, garlic and a quart of flame-roasted plum tomatoes from McEnroe organic farms. 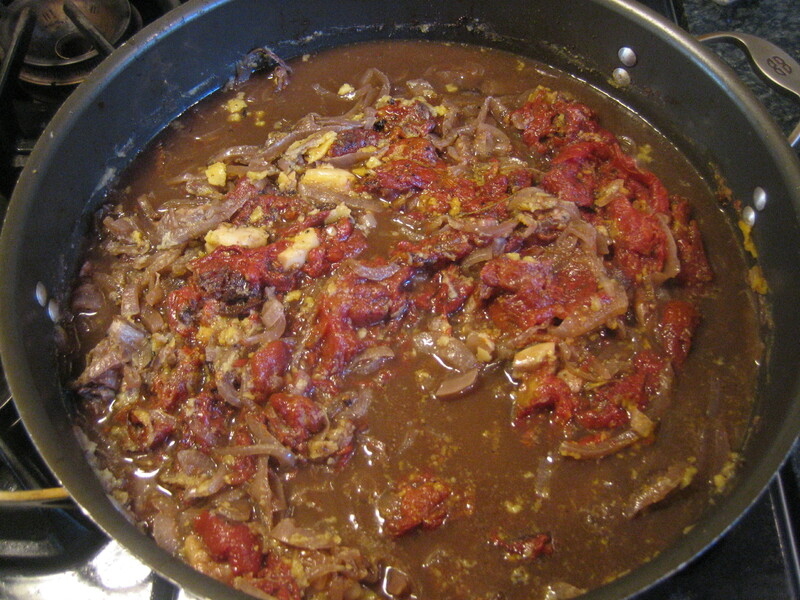 My plan was to make the barbecue sauce with the beef’s braising liquid. 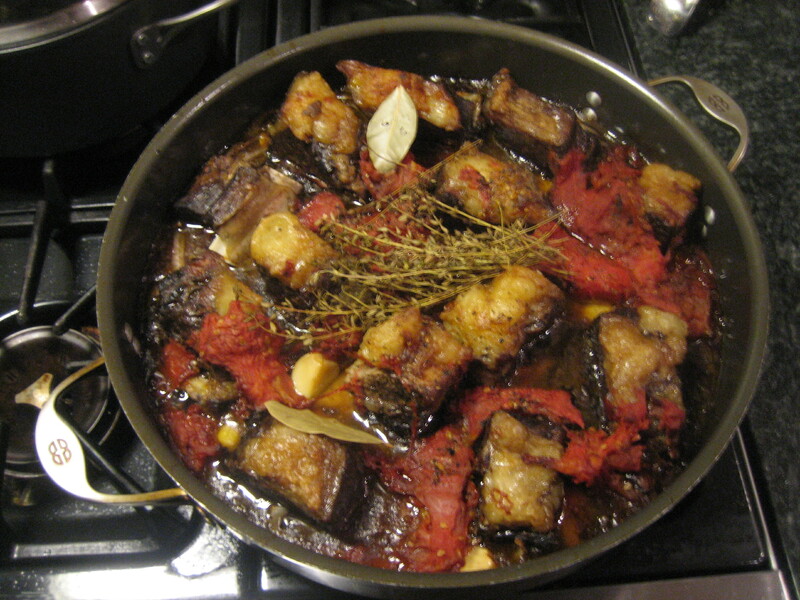 In olive oil, brown short ribs well on all sides. Don’t rush this. The ribs were left un-floured as they were ultimately going to be removed from the braising liquid and glazed with barbecue sauce. 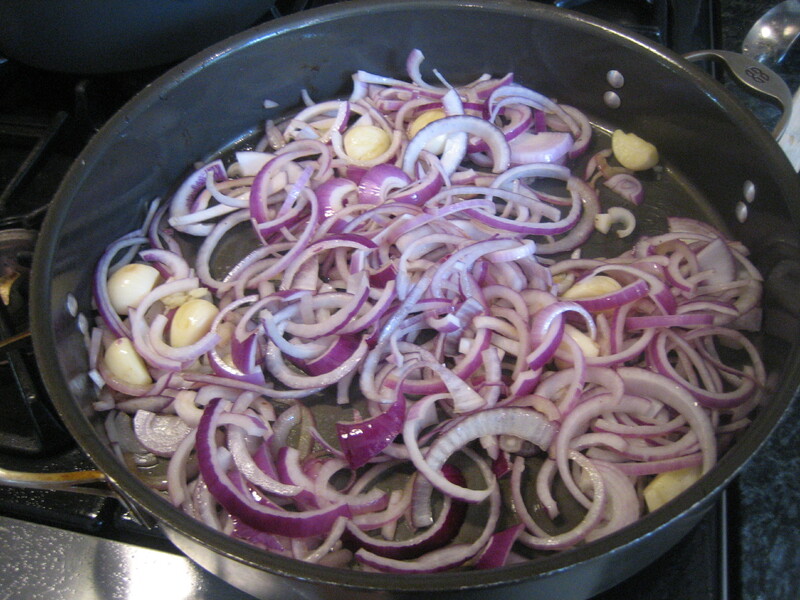 Remove short ribs and add onions and garlic and cook until they begin to wilt. 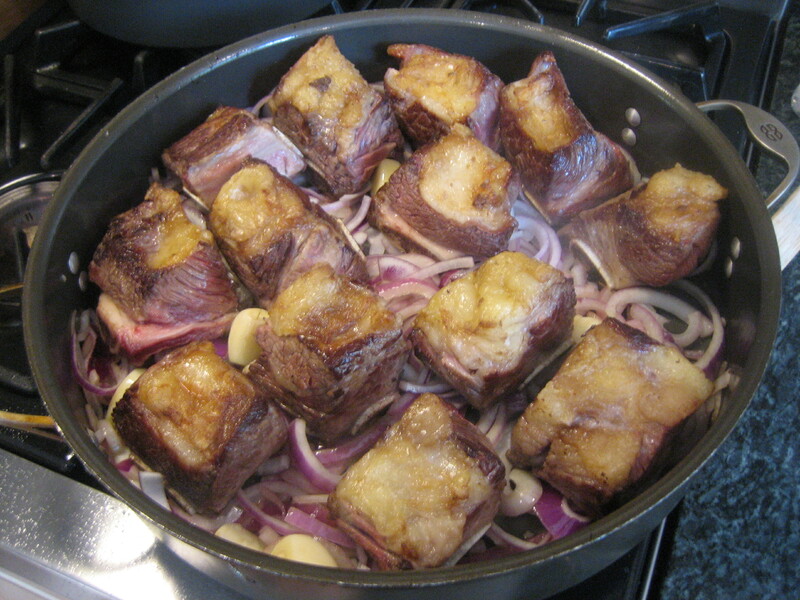 Add back short ribs on top. Spread around the tomatoes – breaking them in your hands as you go. Add some thyme, a few bay leaves and some red wine. Lightly cover — but don’t seal. 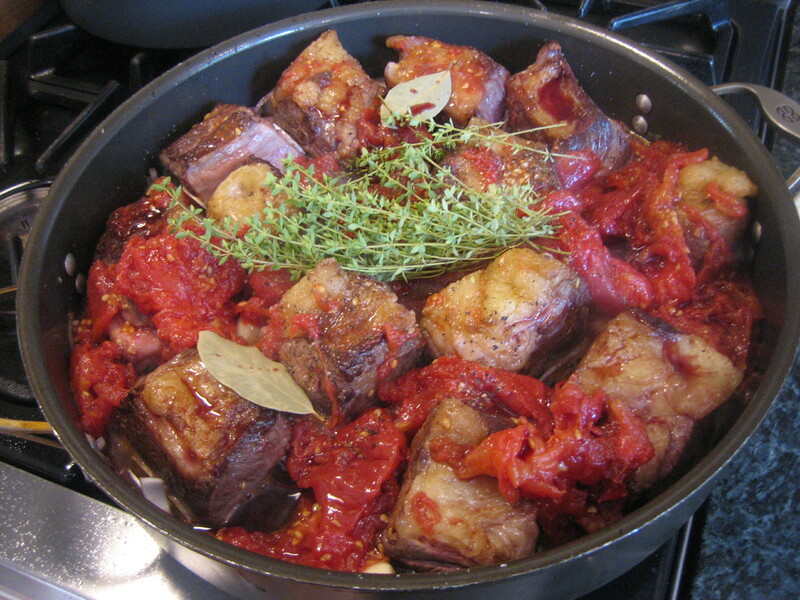 You do not want the braise to steam, but to gently cook in a moist aromatic environment. Place in 225 degree oven for about 3 to 4 hours or until beef is very tender and nearly falling off the bone. This is what I did not do long enough. Here’s the cooked short ribs. To make the barbecue sauce, remove bay leaves and add remaining juice from flame-roasted tomatoes, brown sugar and a touch of molasses, balanced with some cider vinegar, as you want this to be slightly sour rather than sweet. Simmer slowly until very thick. Puree in blender and add back to pot to adjust thickness and seasoning including sweet-sour balance. Add salt and pepper and as much hot sauce as you like. I use Siracha – a Thai hot sauce that has plenty of heat without the sour element present in most American hot sauces. 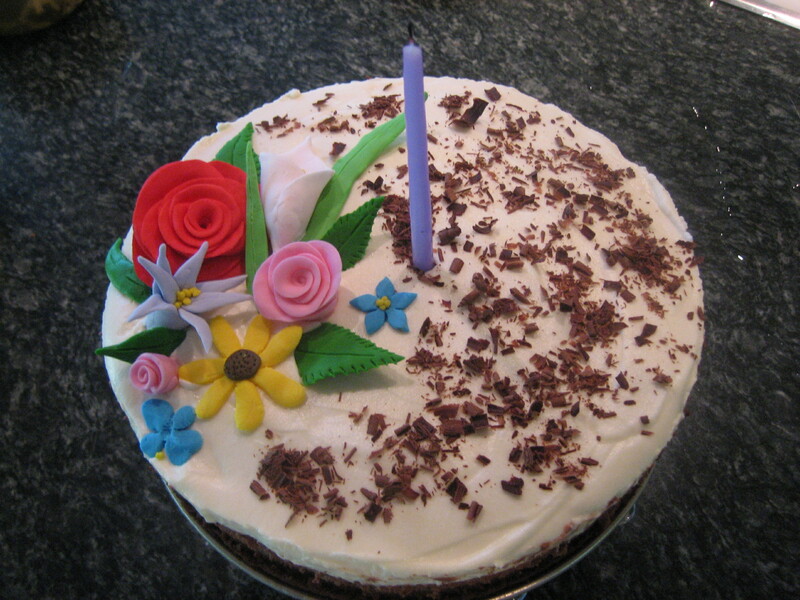 Susan baked a wonderful layered chocolate mousse cake decorated by edible flowers crafted by daughter Sarah. There are lots of ways we could have celebrated Larry’s birthday that were easier. Certainly skipping the Blooming Hill farm dinner would have been a big step in that direction. Certainly I could have done a simpler menu and that’s something I need to work on. I have a tendency to get carried away – to be a Home Entertaining Over-achiever. We could have gone out to a restaurant. That certainly would have been easier…and noisier and more expensive. It is hard to image a nicer, more personal and memorable birthday than the one we had with Larry in his home. 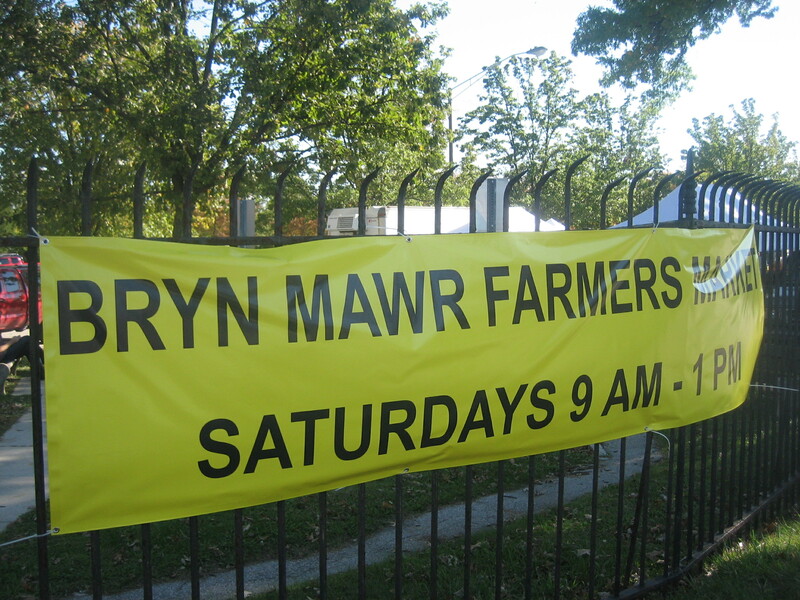 Next Saturday at the Bryn Mawr Farmers’ Market. I am honored to be appearing next Saturday, October 23rd at the Bryn Mawr Farmers’ Market. I will be doing a series of short “mini-classes” each half hour. In between “classes” I am happy to answer your questions about home entertaining. At Home will be available for sale and I would be happy to inscribe your copy. At Home is a perfect holiday gift so start thinking about your list and stock up.Check here for details. On Saturday, October 23rd at 6:30 PM I will be among a long list of guests with whom you can sit at Mt. 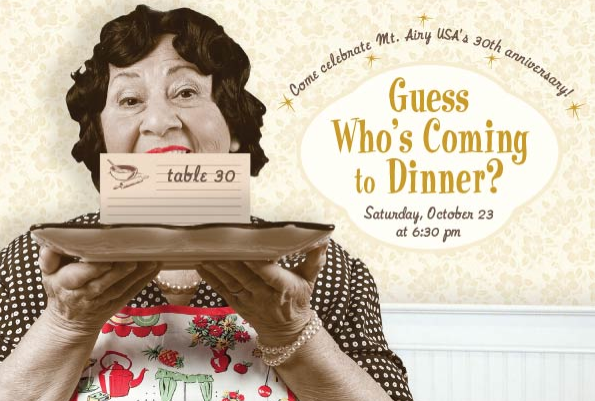 Airy USA’s Guess Who’s Coming to Dinner? Benefit. I’d love to sit with you. Sharp knives are essential kitchen tools. As good as modern day knives are, they do not hold an edge indefinitely. And a honing steel can not sharpen a dull knife. A honing steel can only keep a sharp knife sharp. I guarantee that if you got your knives sharpened, it would make your prep work easier and more enjoyable. Kitchen Kapers, the local kitchenware chain, is offering in-store knife sharpening on Friday, October 29th and Saturday, October 30th. See details as to day and time at your neighborhood store. 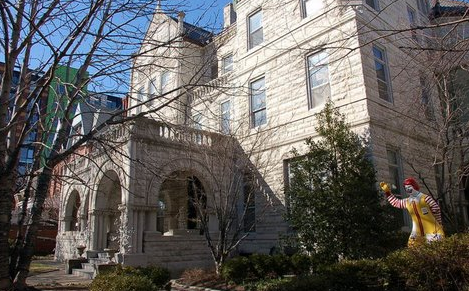 Plus, your knife sharpening will benefit the Ronald McDonald House — where Frog Commissary Catering usually spends Thanksgiving and Christmas, courtesy of a generous House benefactor. On the Road and On the Table: The Farm Stands of Long Island’s South Fork. Look for these post next week. On the Road: Nova Scotia Farmers’ Markets – Lunenburg and Halifax. On the Road: Blooming Hill Farm My visit to Blooming Hill’s farm market and the Saturday evening farm dinner. The final installment of the Farm Stand Series will be reflections on and highlights of my summer’s farm stand journey and thoughts on how to make the farm stand and farmers’ market experience even better. For access to the complete list of At Home Blog recipes, visit Recipe Index. 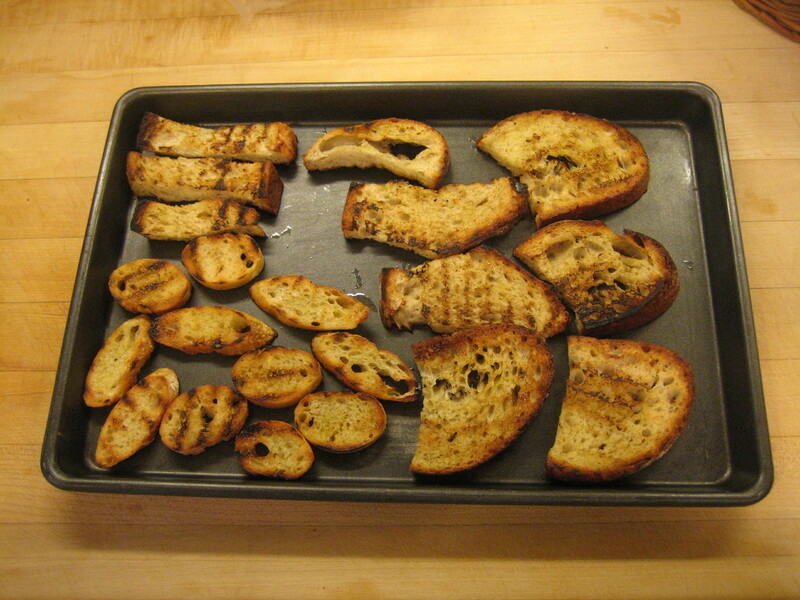 Grilled bread is a versatile, multi-purpose accompaniment that once you master it’s relatively simple technique, will become a crowd-pleasing stable at your table. 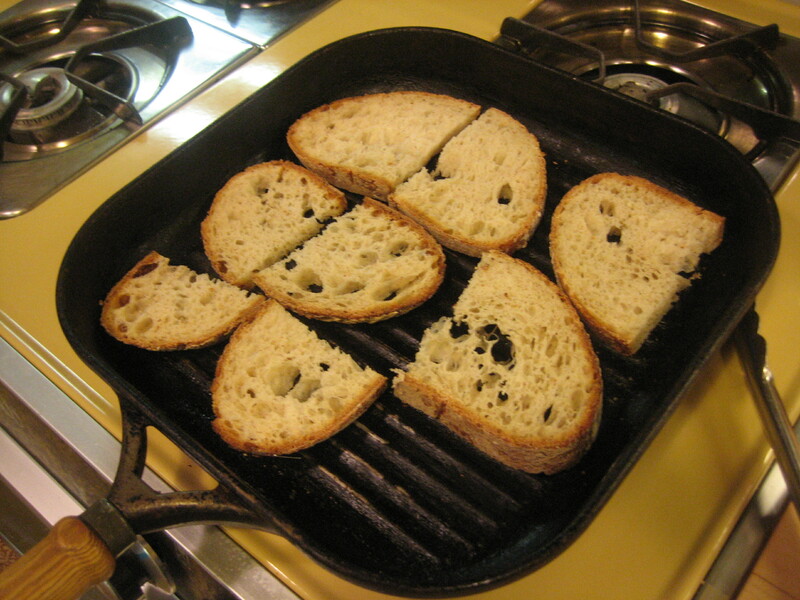 In grilling bread, your goal is to maintain a slightly spongy interior to the bread and “wrap it” in a crunchy exterior. The charring provides a more complex flavor than simply toasting. The spongy interior enables bread to absorb liquids. Taken together, it is an altogether more compelling experience and than fully crisp cracker or oven-baked crostini. Grilling bread is more a matter of staring with good bread and technique than it is a recipe. Good bread is critical. 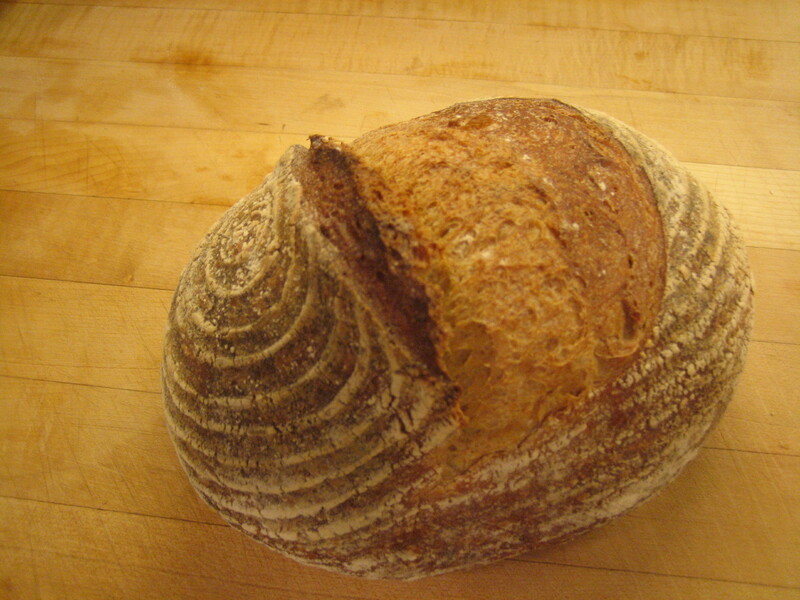 You want bread that has a firm crust with a spongy interior rather than a cottony interior. Sourdough is best. Ciabatta is a bread that has the sort of texture you want and is often available in supermarkets. In my experience, if you live in the Philadelphia area, the best bread comes from Metropolitan Bakery. Here’s what you need to grill bread: Good bread, spring tongs, a bread knife — though you could use pre-sliced bread, olive oil, and, of course, a grill or grill pan. Pictured above is a Metropolitan ficelle in the foreground and a Metropolitan Country White. 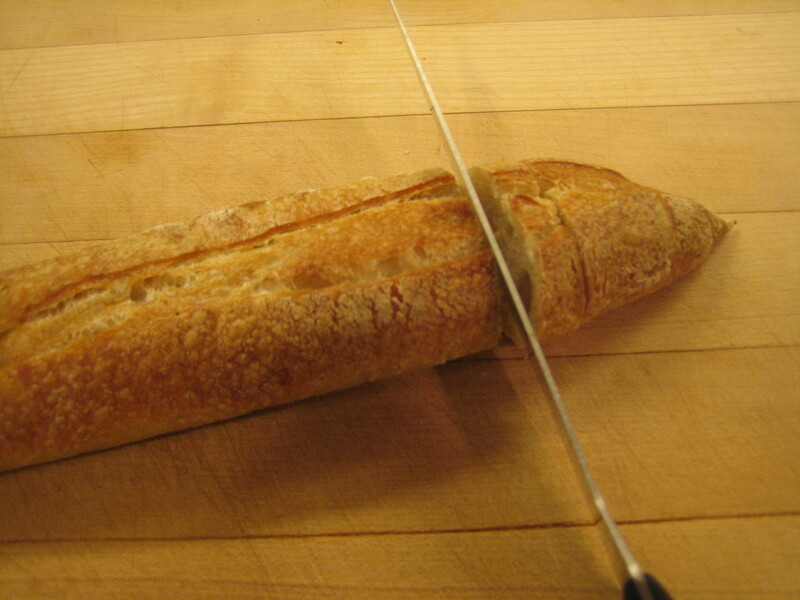 A ficelle is a smaller-sized baguette-style bread. Due to its smaller size, it makes for a somewhat more “mouth-friendly” sized hors d’oeuvres. 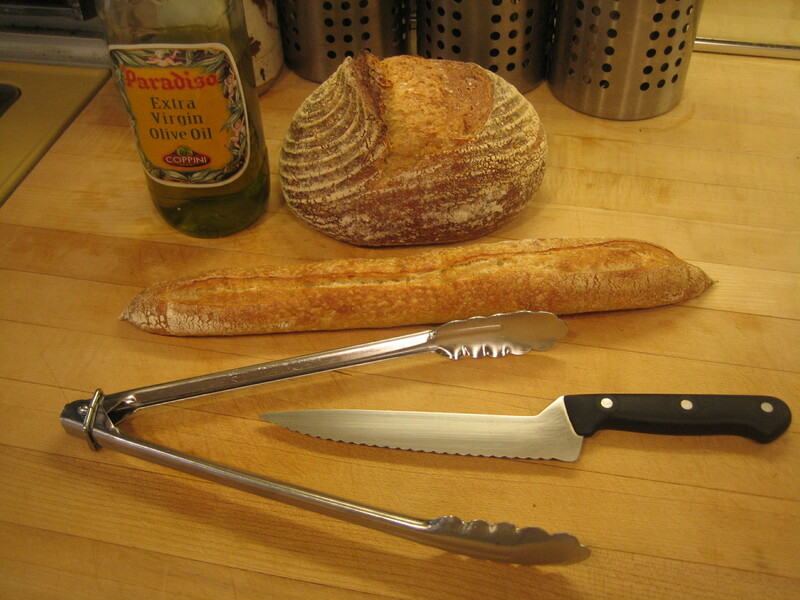 There are several ways to cut your “baguette-style” ficelle. Cutting it straight across makes more round slices. 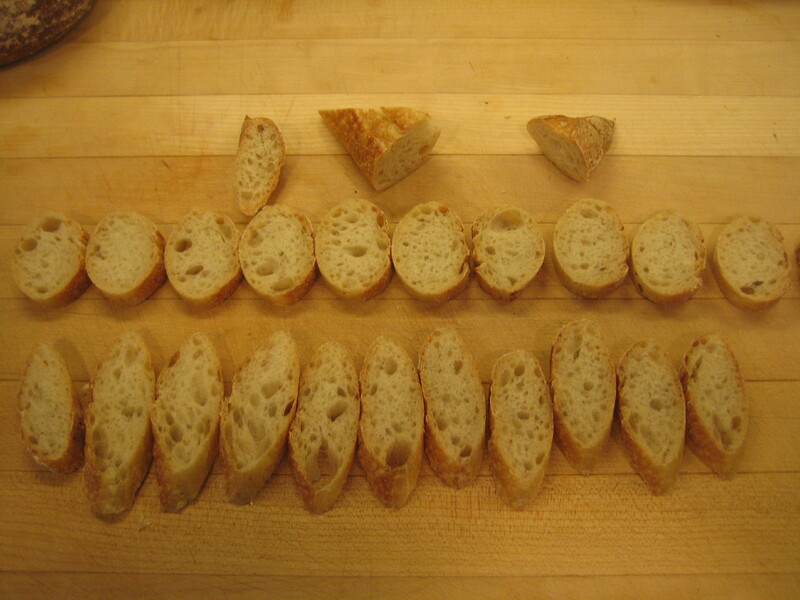 A bias or angle cut produces longer more oval slices. The rounder sizes are on the right. In foreground are bias cut — longer and thinner than the rounder straight cut in background. This is a loaf of Metropolitan Bakery Country White. Larger pieces of grilled bread are better for accompaniments with dishes that have liquids that beg to be sopped up on bread. 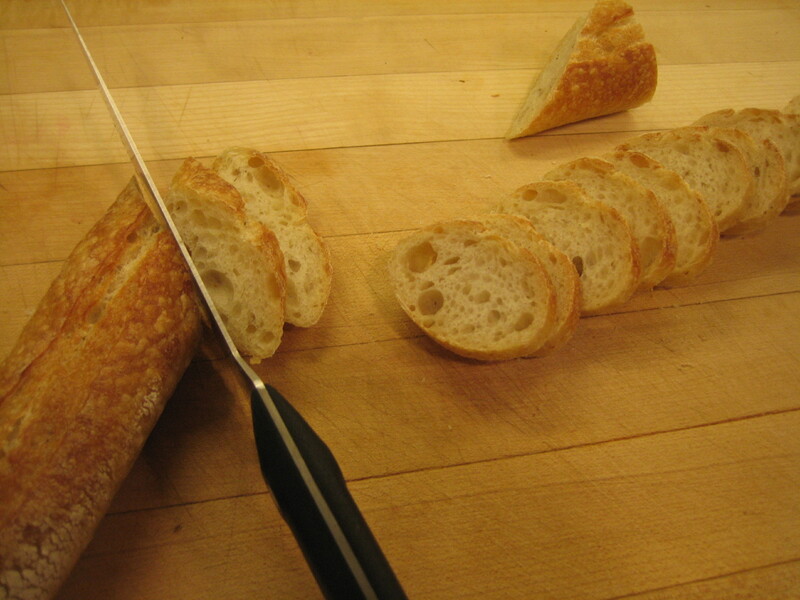 By cutting the bread yourself rather than buying it sliced enables you to control the thickness of your bread. Cut slices about 1/2 to 1-inch thick. Cut large slices in half. A variety of cuts. 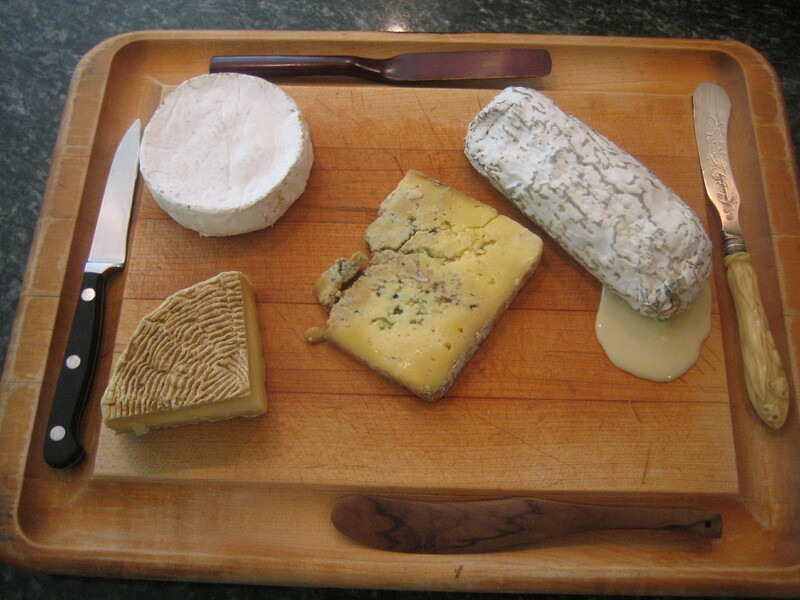 The cuts from ficelle are ideal for hors d’oeuvres or cheese. The half slices and “fingers” work best served with something that has liquid that needs something more spongy such as an amply dressed tomato salad or steamed mussels. 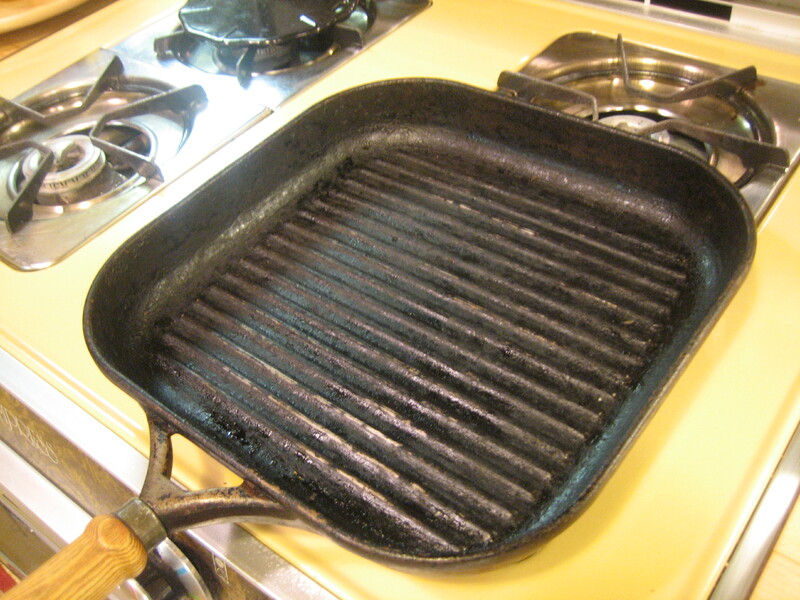 Pre-heat grill, or in this case, the grill pan over moderate-high heat. 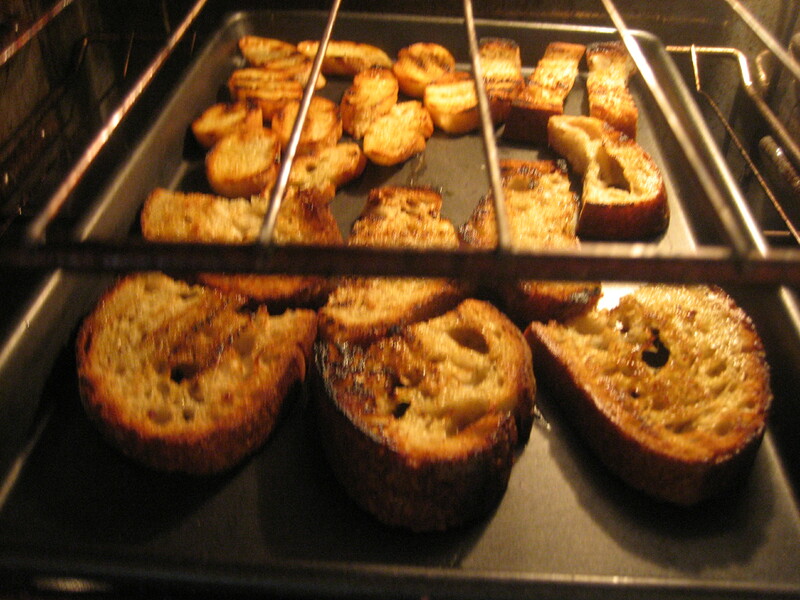 You may need to slightly adjust heat source if you find bread grilling too quickly or too slowly. 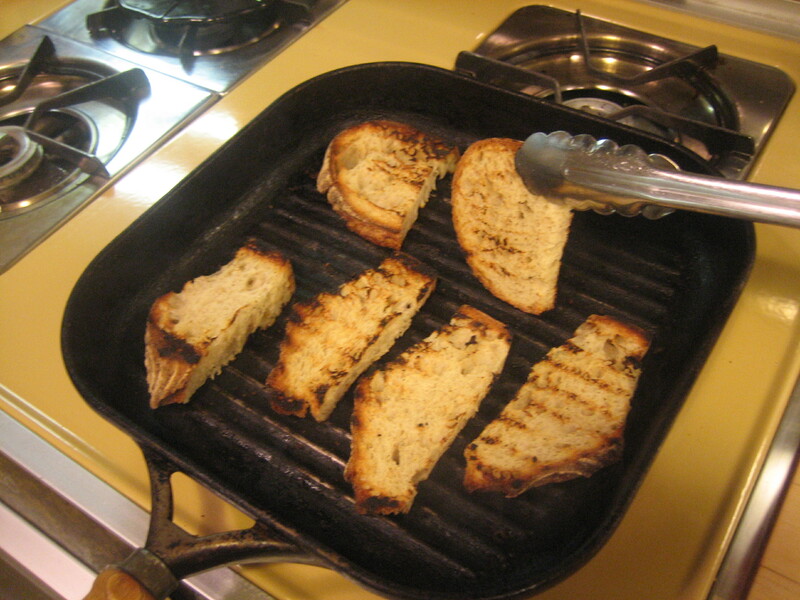 Once bread is well-grilled on one side, turn it and grill on other side. Don’t hesitate to sample an occasional piece as you go to check bread’s progress — slightly crunchy exterior and lightly spongy interior. Another “tell” is bread should still be slightly pliable when you bend it rather than fully crisp. Once you do this, the “skills” and “tells” of grilling bread will become second nature for you. 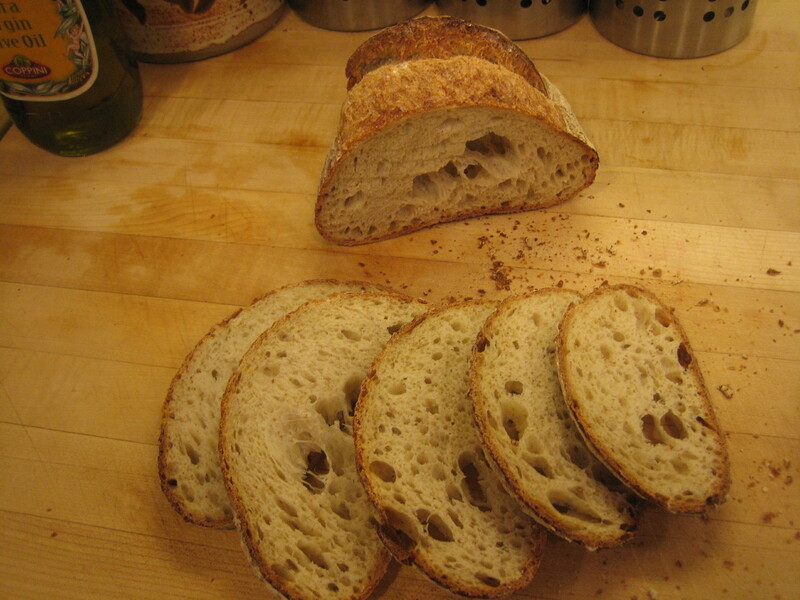 Thinner bread has less room for error if you want to maintain a slightly spongy interior. 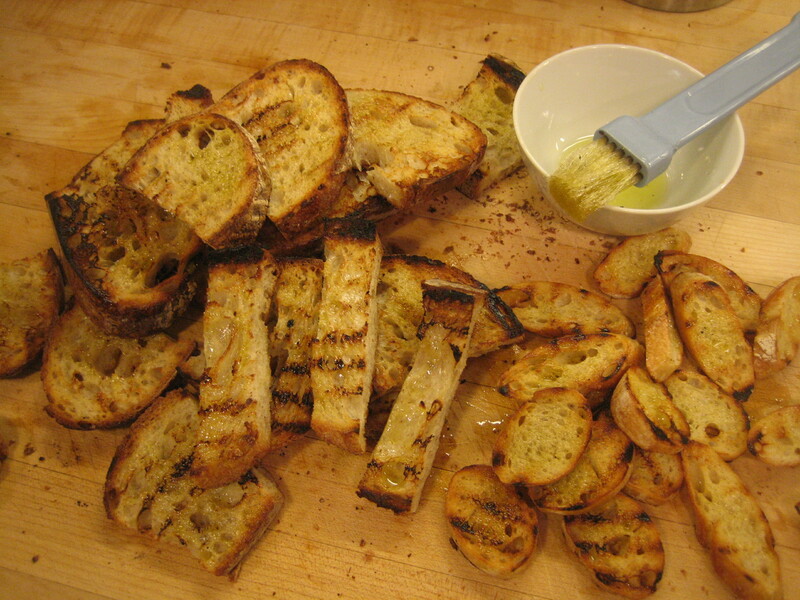 Once all your bread is grilled, lightly brush on both sides with olive oil. Serve immediately or within a few hours. If bread sits longer than that, it will be helpful to re-fresh in oven. 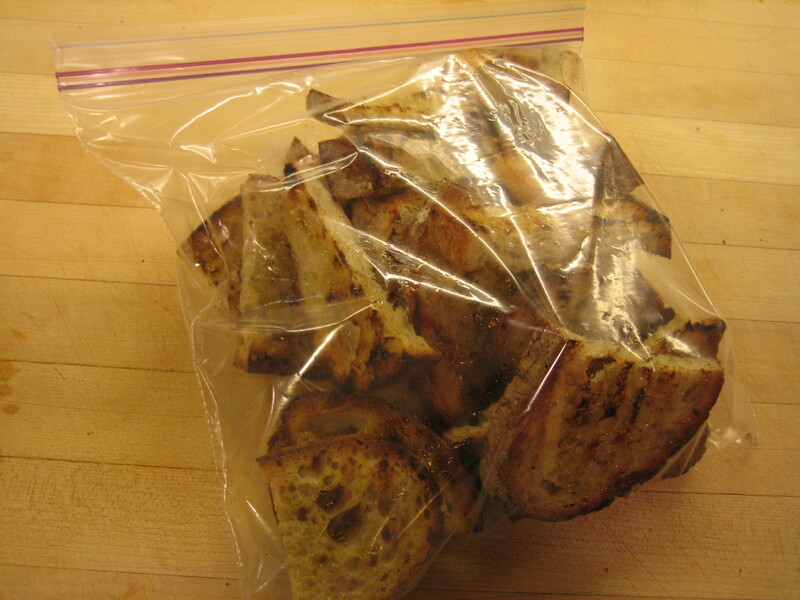 Bread can be stored for up to five days in an airtight container and refreshed before serving. …place in pre-heated 350 degree oven. The smaller pieces need 3-5 minutes and larger, thicker pieces take 7-10 minutes. You goal is to restore the crunchy exterior crust while maintaining a slightly spongy interior. 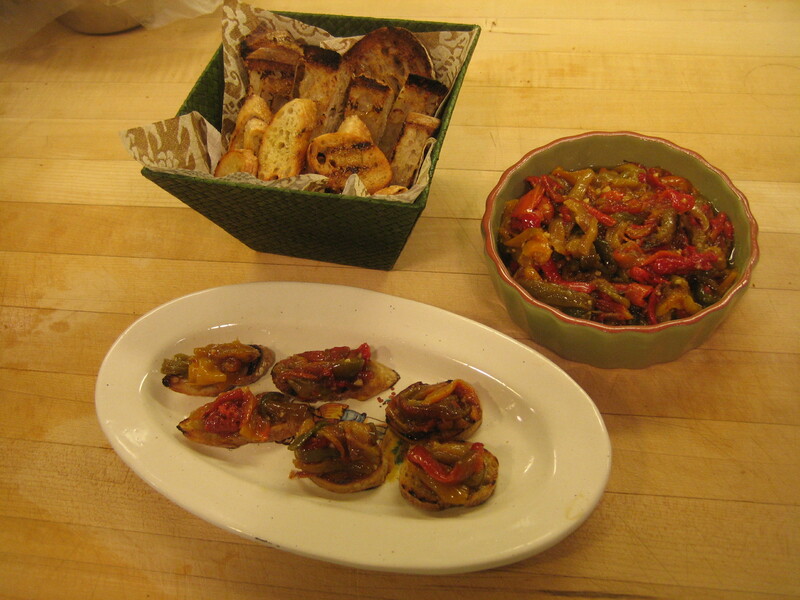 Grilled bread is the ideal accompaniment to Marinated Roast Sweet & Hot Peppers. Serve a bowl of peppers along with a basket of grilled bread — including a small fork for guests to make their own. 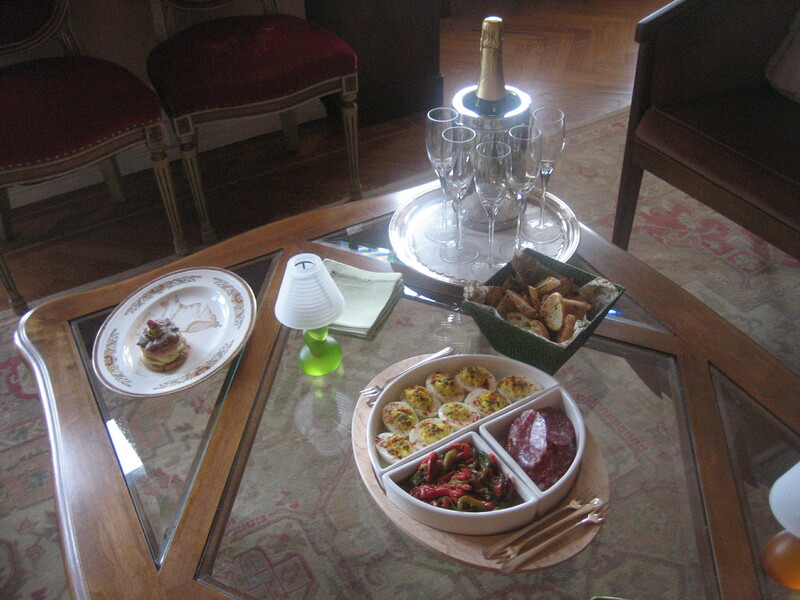 Or make individual hors d’oeuvres and serve on a platter. Note: For the complete library of At Home blog recipes, see Recipe Index. By mid-summer, sustained heat produces a rainbow of peppers at farm stands and farmers’ markets. These peppers are transformed by roasting such that when paired with slightly soft grilled bread, they are one of the great pleasures of sitting around with friends and family in summer. When buying peppers, select an assortment of colors — mostly sweet peppers with an occasional hot pepper — enough to keep things interesting and preventing a bland bowl of just sweet peppers. 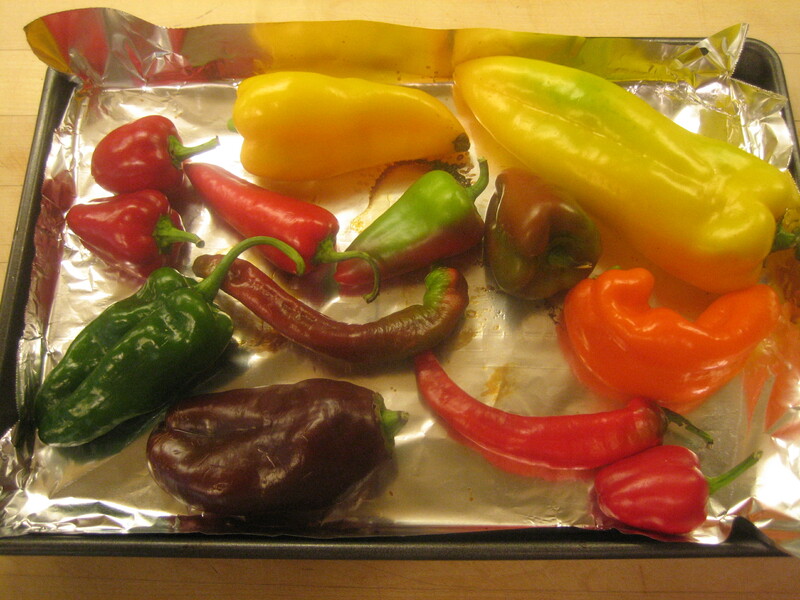 If using supermarket peppers, select a mix of red, yellow and orange. They are expensive, but worth it. Do not use green bell peppers as their taste is too aggressive and not sweet. For hot peppers, use mildly hot Poblano or Anaheim and Cubanelle. 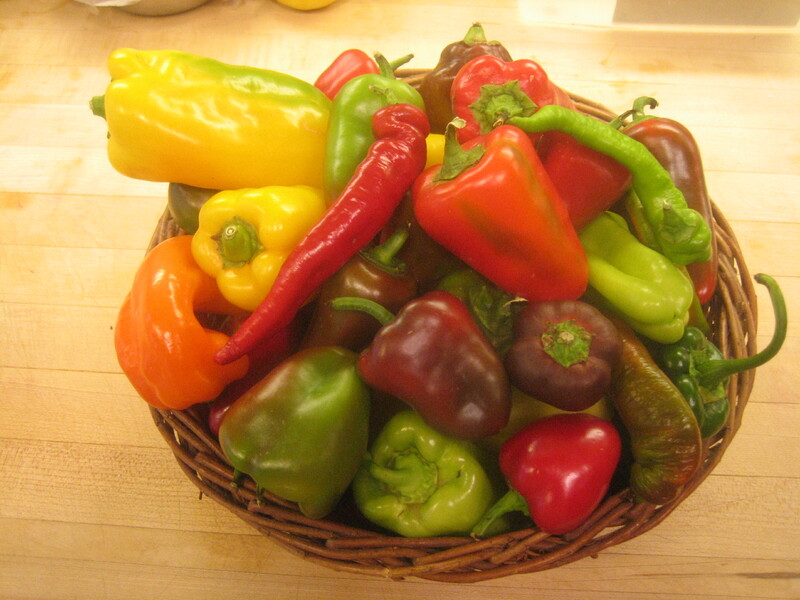 You want substantially more sweet peppers than hot – maybe five to one. You will definitely need a spring loaded tongs to turn peppers while charring so don’t even try this without them. 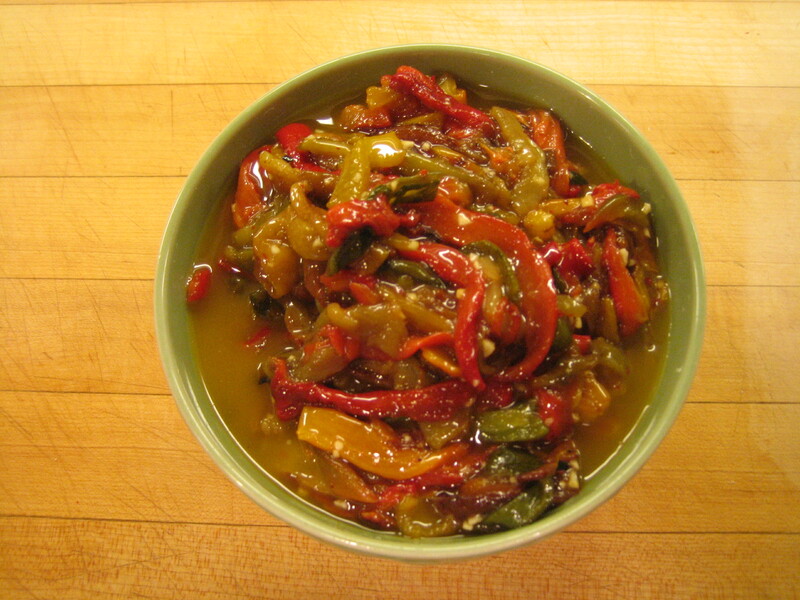 Do ahead Marinated peppers will sit happily in your refrigerator for a month. 2. 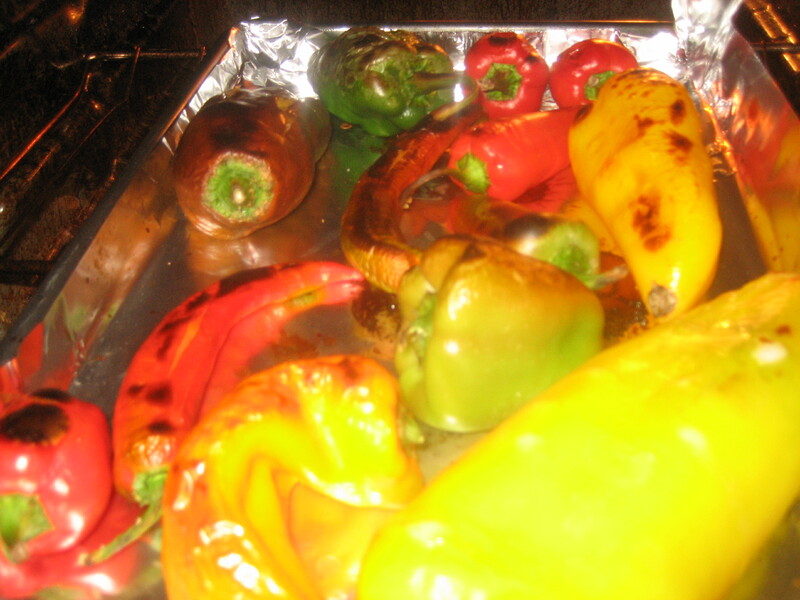 Place peppers on foil-lined heavy duty rimmed baking sheet. 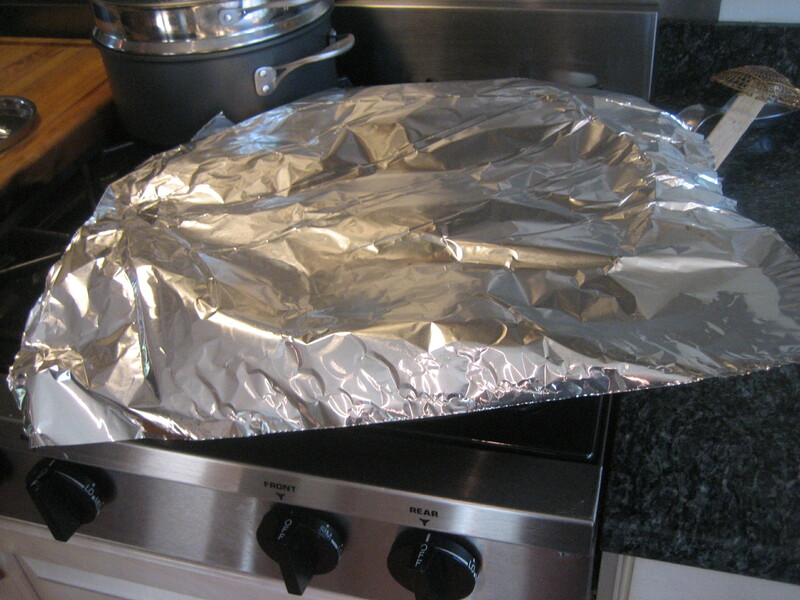 Depending on how many pounds of peppers, a double layer of foil may be useful to protect your pan and make clean-up easier. Place peppers on sheet and place on shelf closest to flame. Broil until lightly charred, turning peppers as you go to char all over. 3. Remove peppers from oven and immediately transfer to bowl. Cover with plastic wrap to steam peppers. This facilitates peeling peppers. 4. When peppers have cooled enough so they can be handled, place on cutting board. Pull away stem. Peel away skin. Split peppers in half. Remove seeds. 5. When all peppers have been peeled, lay peppers flat. Cut into thin strips. Cut long strips in half. 6. Transfer strips of peppers to bowl. Add garlic, good olive oil and salt. 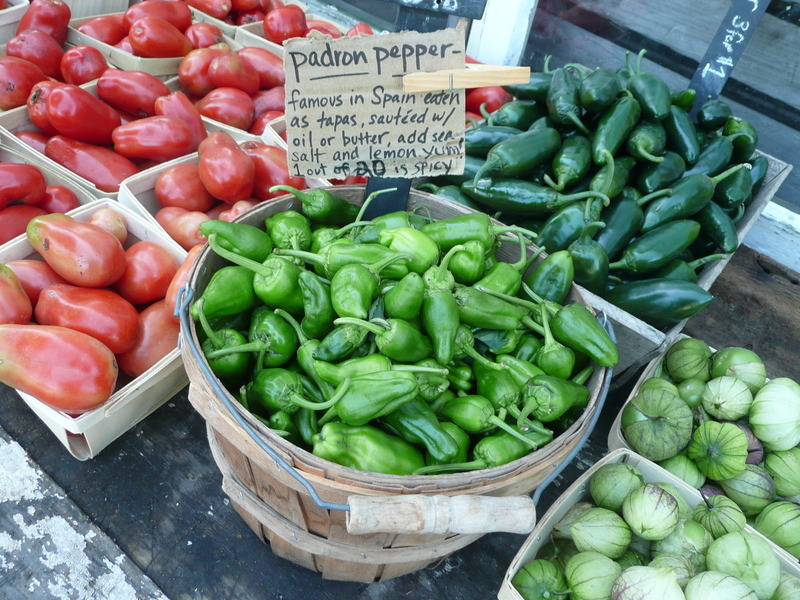 This is a wonderful assortment of peppers purchased at several Philadelphia farmers’ markets. Roasting, peeling and removing seeds is a project made easier if you avoid smaller and long, thin peppers. Peppers are variable in the time it takes to char and blister so be patient. This is a result of pepper size and how different peppers skin reacts to heat. Most broilers have two rows of burners down the middle so some peppers will be closer to heat than others. You will need to rotate peppers. Rotate peppers as you go. As they are round, they may prove slightly stubborn about maintaining the position you want them. As they soften, don’t hesitate to apply a little pressure — squishing them to position them as you need to. 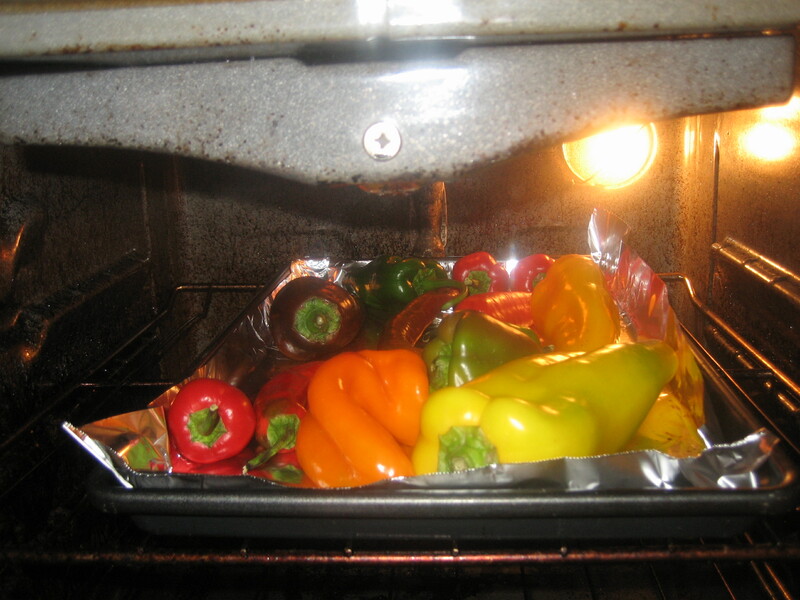 Instead of a broiler, you could do lots of peppers at a time over a hot grill. Char peppers over high heat. Turn as you go. 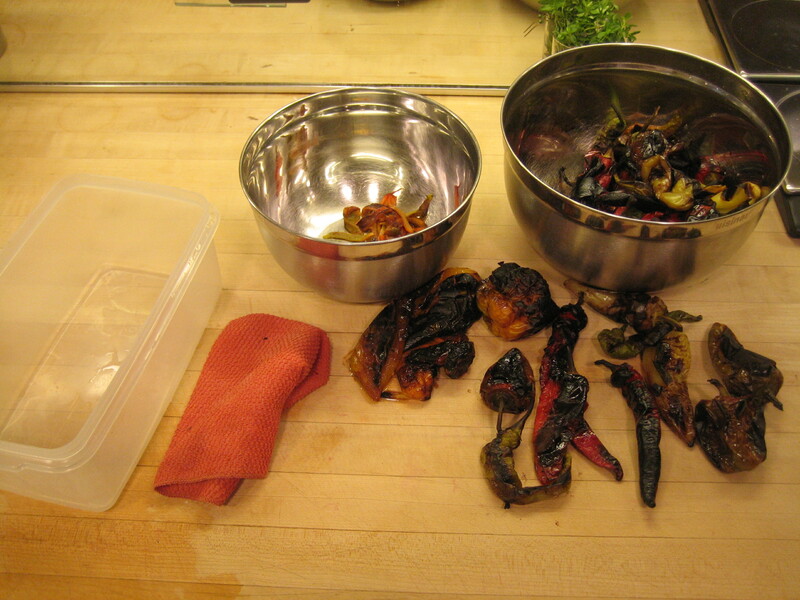 Remove fully charred peppers to bowl and cover. Add more peppers as space allows. 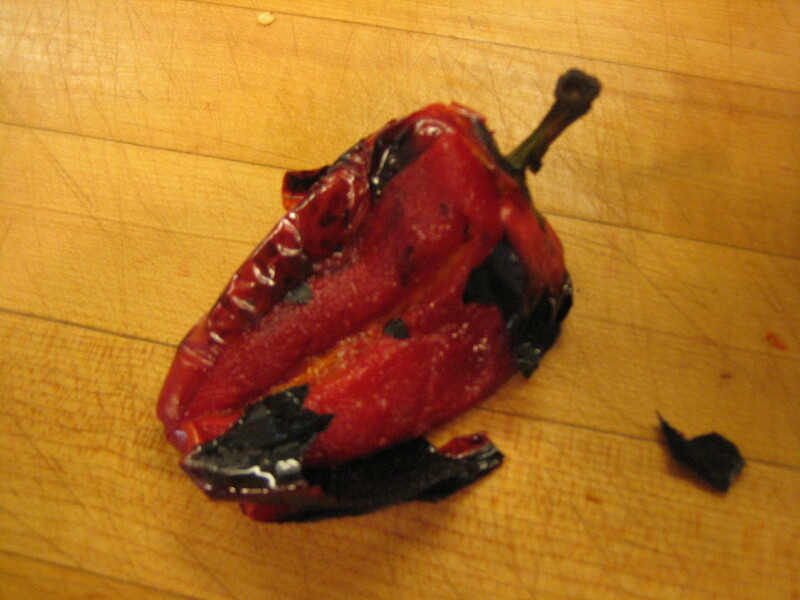 Peppers do not have to be fully charred, but can be substantially blistered and you will be able to peel away skin. 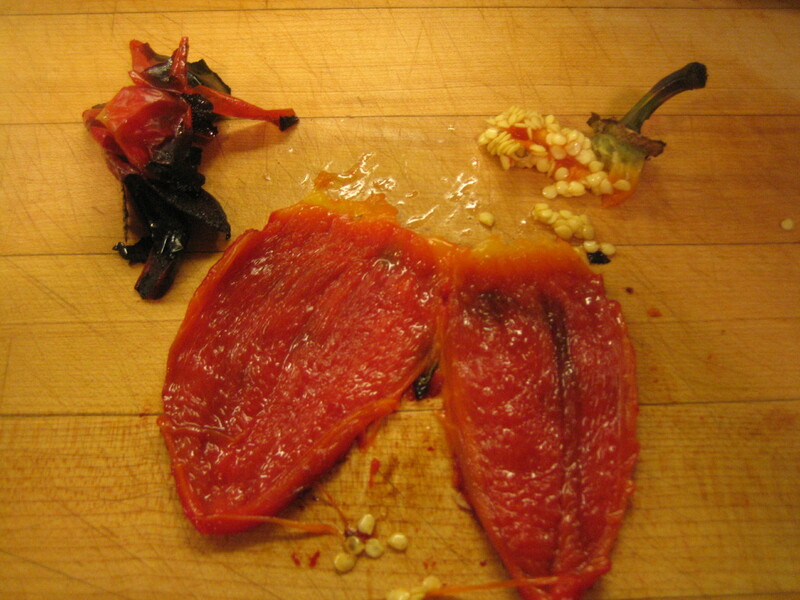 As peppers heat, the air inside will expand and some peppers will “explode” — simply meaning they will split open. This is fine. 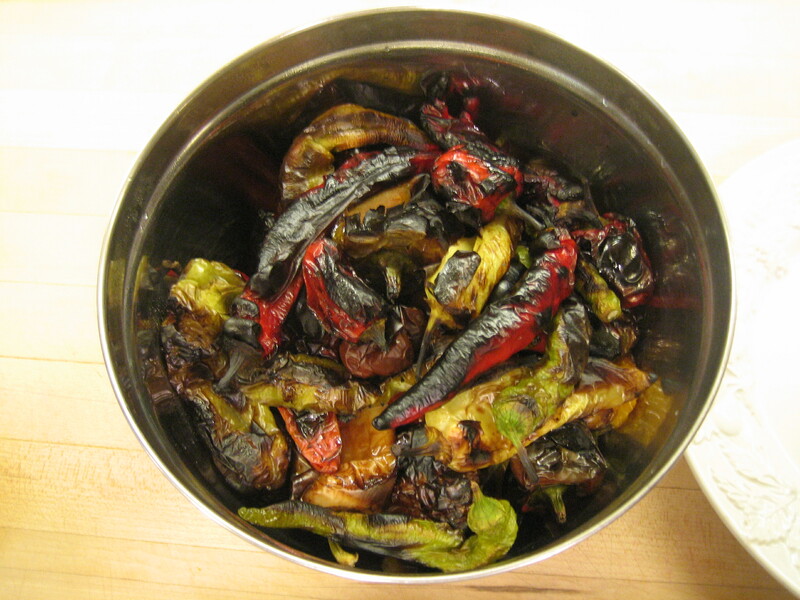 Transfer charred peppers to a bowl and cover so they steam. 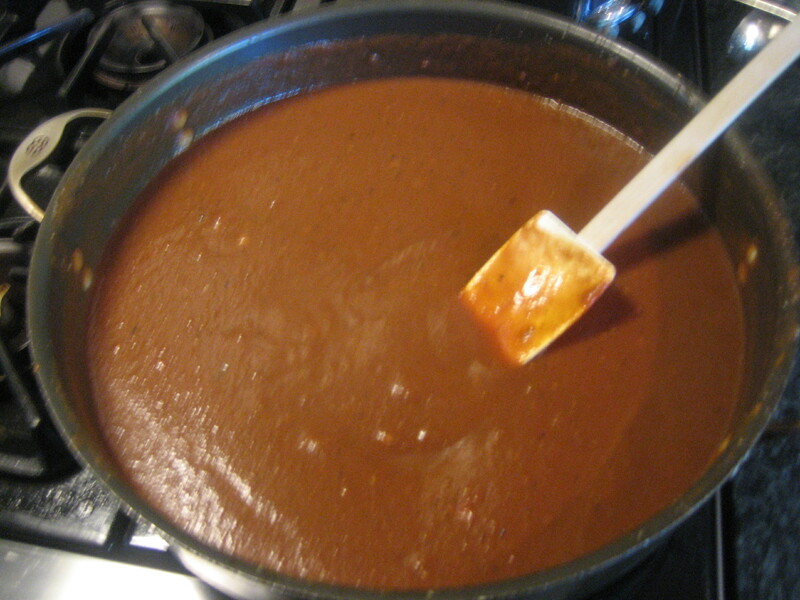 Steaming helps to remove charred skin. Rather than wrapping and unwrapping with plastic wrap, you can just place a plate on top to “seal” bowl. 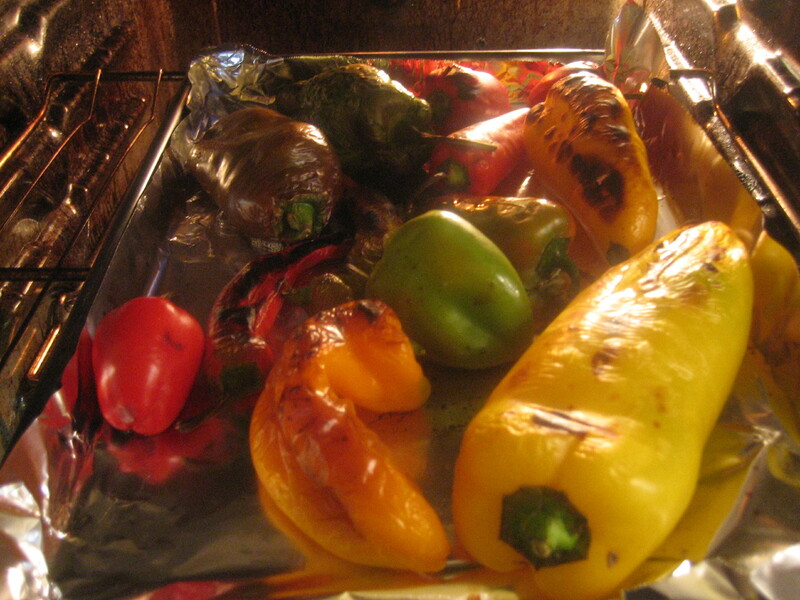 As peppers char on outside they steam and soften on the inside. Keep both your covered bowl for charred peppers and your un-charred peppers near broiler to make it more convenient to deposit your charred peppers and add un-charred peppers to the tray as you go. 1. 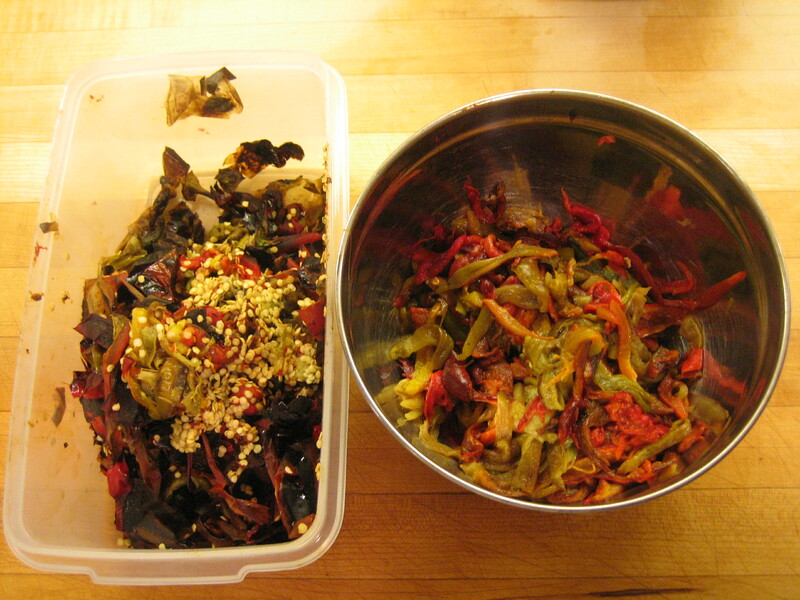 Container to discard peel and seeds. 2. Damp cloth to keep area clean. A pastry scraper also helps. 4. Bowl of charred and steamed peppers. You will also need a sharp paring knife to scrape away peel and cut strips. Larger, thicker peppers are easier to peel. You have to be pretty careful with thinner skinned peppers to remove peel and seeds without destroying peppers meaty flesh. First remove stem and peel from all peppers waiting to remove seeds until all peppers are peeled. You can just pull out the stem or cut away the pepper’s top including stem. Next, split peppers and carefully remove all seeds. As you go, it is useful to continuously wipe your peeling and seeding area clean to prevent pesky peel and seeds from sticking to the peppers you have cleaned. Stack cleaned peppers in bowl. Take care in handling hot peppers. The volatile oils will sit on your fingers — and counter and cutting surface — and if you touch your eye or other soft membrane it will be painful. If this happens, wash well with soapy water and rinse well. Once you have peeled all peppers and removed seeds, take one or two peppers at a time, check to be sure that there are not errant seeds sticking to pepper and lay flat on cutting board. 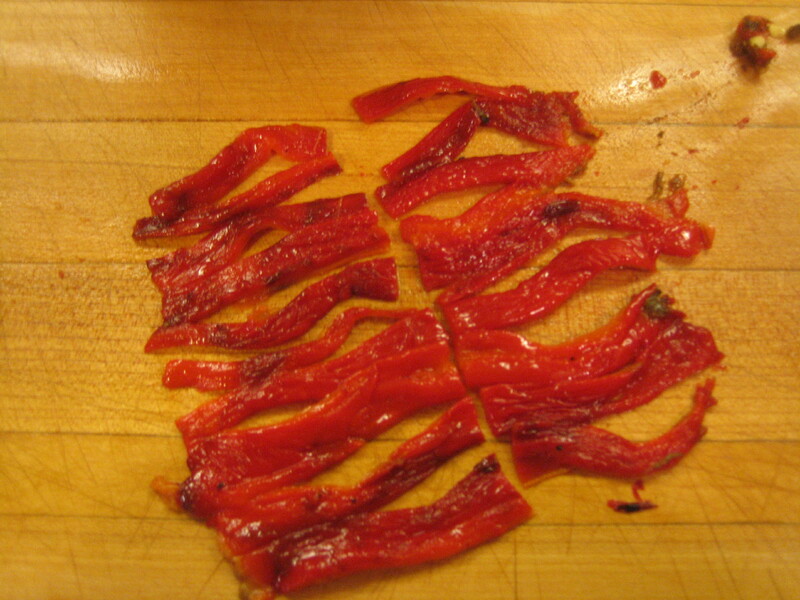 With a sharp knife, cut peppers into strips. If peppers are long, cut strips in half. 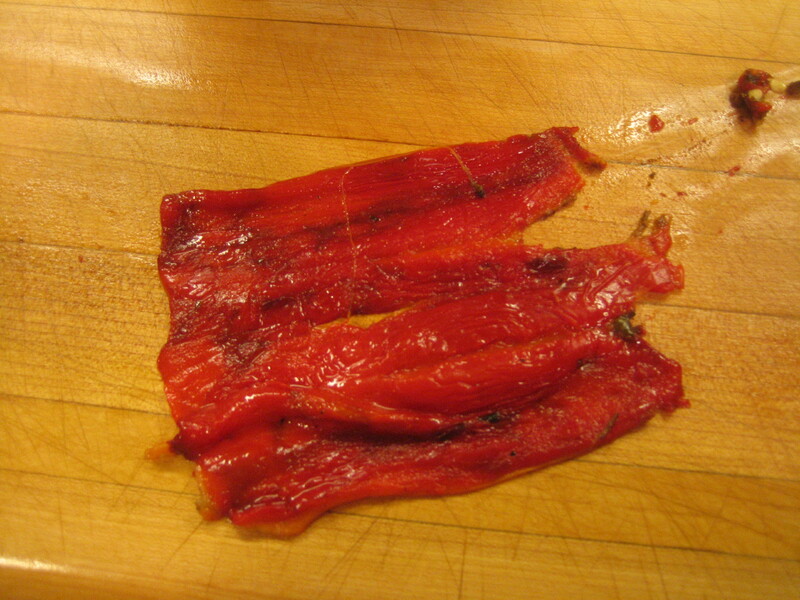 Long strips of peppers are messier when placing on hors d’oeuvres-sized crostini or grilled grilled bread. When you are done you have wonderfully naked strips of sweet and hot peppers waiting for their marinade…and a mess of peel and seeds to discard. This is a double batch. Garlic is the natural compliment to peppers. 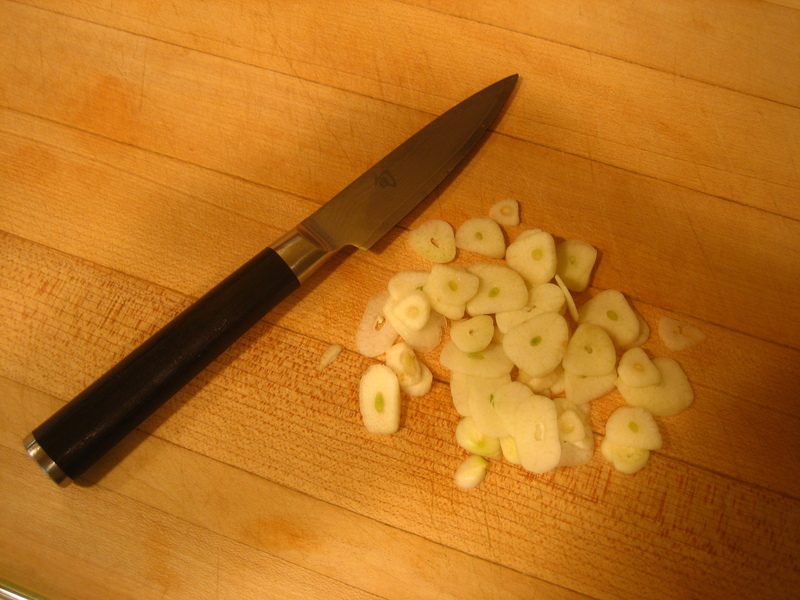 Patiently chop until garlic is very finely chopped as you don’t want your guests biting into a chunk of garlic. The garlic is not essential, but strongly recommended. Mix peppers well with garlic, good olive oil and salt. They get better the longer they marinate and will keep in refrigerator for a month. 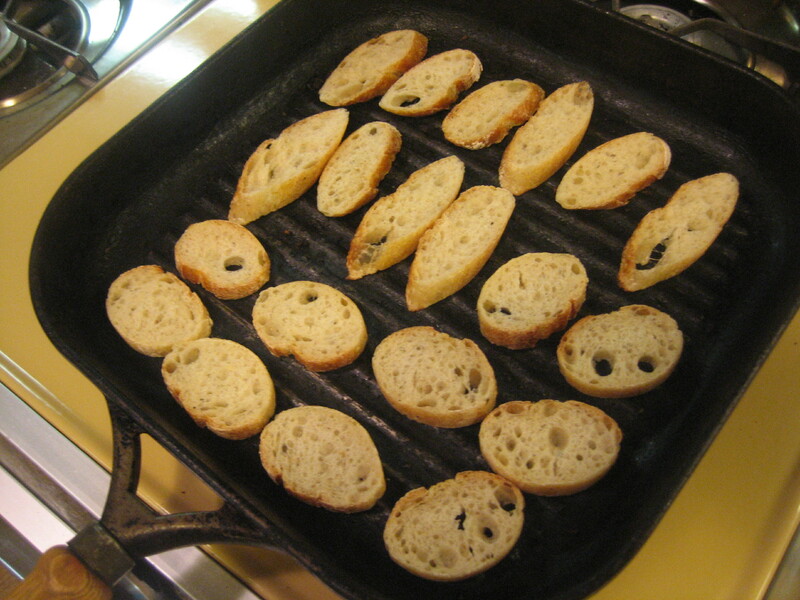 Serve on crostini or grilled bread. See At Home Page 82 for a crostini recipe. At dinner’s end, with guests gone and a tired me sitting on the couch, Christina nicely extolled a wonderful dinner. While I appreciated her compliments, I expressed that this dinner was not a culinary triumph that required any great skill. I asserted, as I often do, that preparing a nice meal is more a matter of aspiration and planning than it is any great skill. You could have prepared this dinner. Here is the slightly ridiculous haul from my drive through Northern Chester & Montgomery Counties. My farm stand shopping is a matter of faith. I have faith that when I get home I will find good uses for all that I have purchased over the week. Dinner began at 7 PM with the Blanc de Blanc Champagne from J.Maki’s Chester County winery. Everyone agreed it was excellent by any standard — not just excellent for being a local champagne. 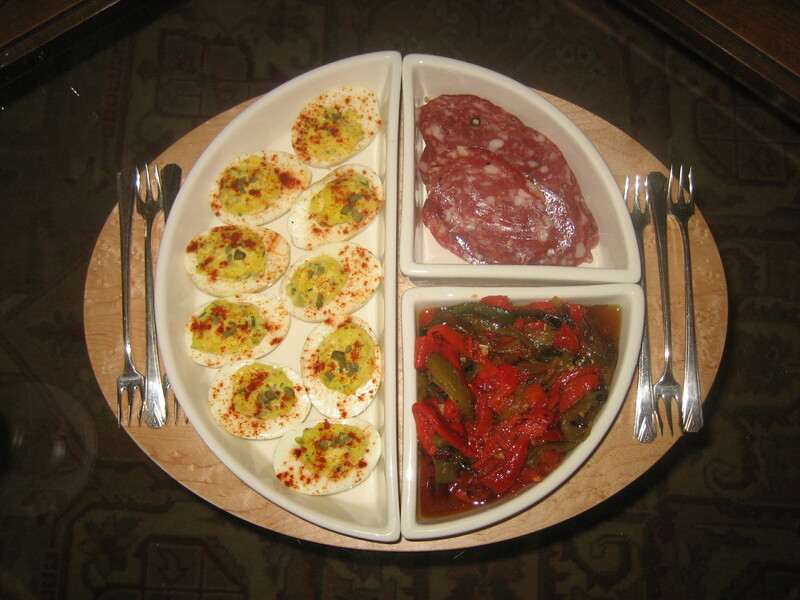 Light hors d’oeuvres included roast, marinated sweet and hot pepper, deviled eggs and a DiBruno’s house-made soppressetta. The deviled eggs includes mayonnaise, mustard, a tiny dice or cornichon, fresh chives and topped with sweet smoked Spanish paprika. 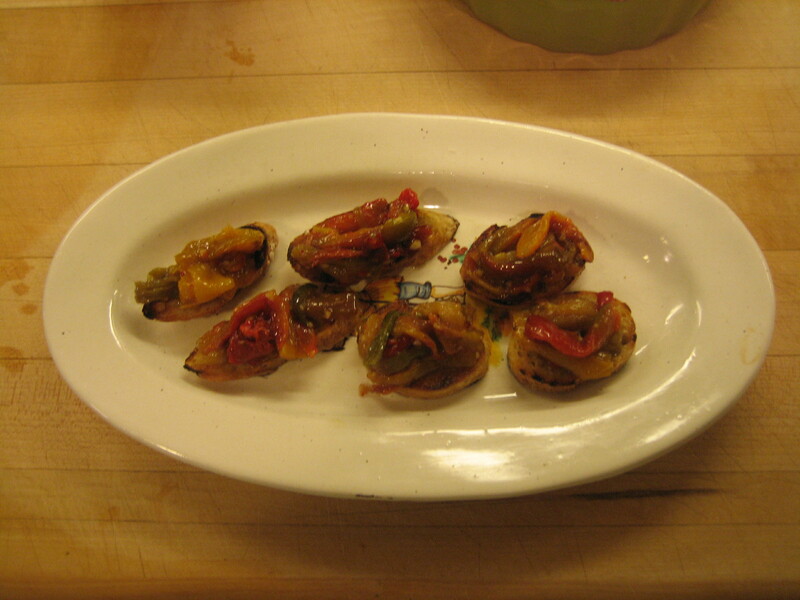 Frankly, the roasted peppers were a pain to peel — but they were possibly the unexpected hit of the evening. I bought them at a stand in a residential street from a “backyard” farmer whose mode of transport was a golf cart rather than a tractor. The peppers were arrayed in little plastic baskets like we use to serve burgers at Frog Burger — $1 a basket, one red sweet and one hot green. 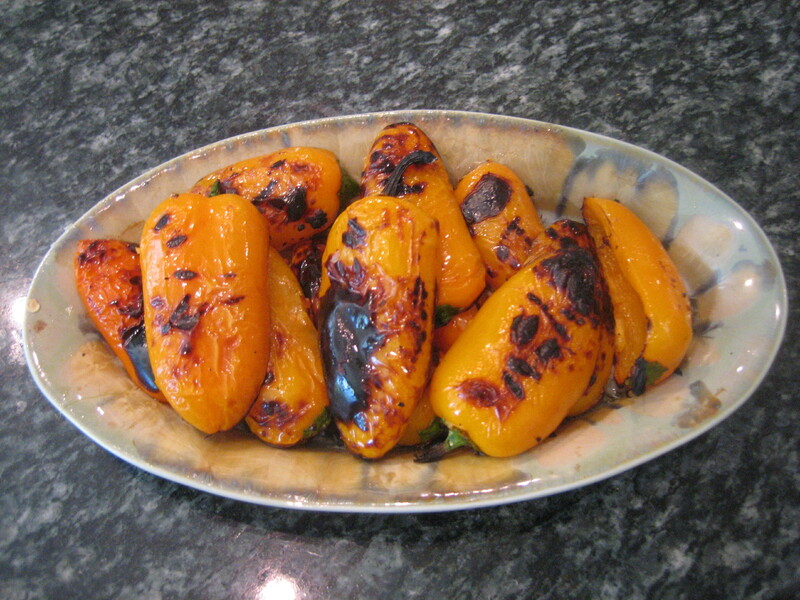 But they were very thin-skinned peppers that were difficult to peel after I charred them in the broiler. I cut them into short, thin strips and tossed them in olive oil and garlic. They were served with grilled bread — something a bit different from fully crisp crostini. 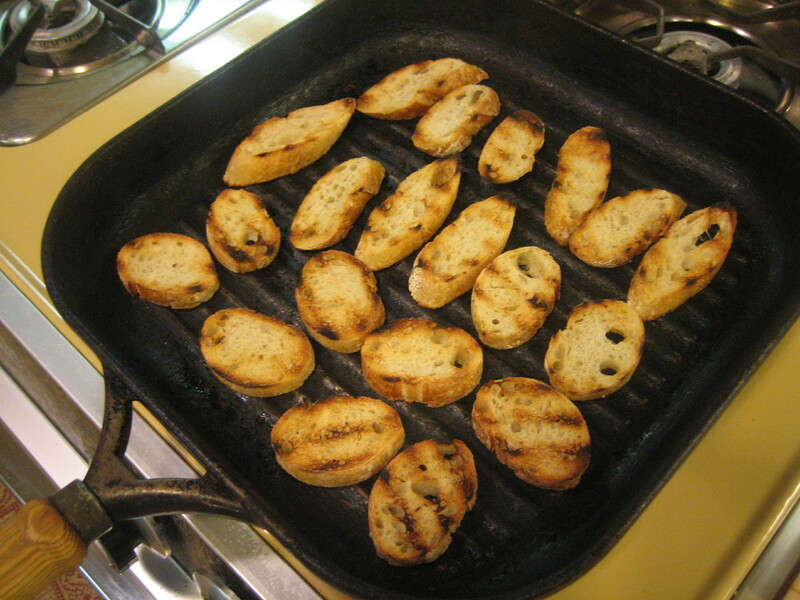 I plan to post a “How to Make Grilled Bread” Tip in the next week or so. DiBruno’s house-made dried sausages are a go-to easy hors d’oeuvres addition. Another very easy hors d’oeuvres are sliced diver scallops — also know as dry scallops because they are not packed in that awful white liquid that lesser quality scallops can be packed. They are simply thin-sliced and “dressed” about a half hour before guests arrive with lime juice, olive oil, chives and crushed toasted coriander seed — plus a little sea salt and pepper. There is a similar recipe on page 149 of At Home using pink peppercorns. Unlike recent weeks when dinner was served family style on the table — that is, on platters where guests helped themselves, this menu was a plated dinner. This cold beet soup is the third cold soup I have done this month. As frequently noted, I am a fan of soups as meal starters. They are easy, do ahead and lend themselves to dressing up. Here, the soup is dressed up with a small dice of cucumber, a dollop of sour cream and fresh dill. To make the soup, I just peeled the beets, cut into similar-sized chunks, cooked in a corn stock with onion and garlic, pureed in a blender and flavored with red wine vinegar. Look for the recipe tomorrow. The cold soup co-opted the first course that would likely included tomatoes so I added a small tomato salad to the menu. I picked up some beautiful red accented lettuce from the Z Farm stand on Rittenhouse Square in the morning. The tomatoes and sweet onion came from my trip as did the basil. So, this is just the lettuce, two slices of tomato, topped with small yellow pear and orange tomatoes — cut into half as even the smallest tomatoes should be — dressed with a little balsamic, very good olive oil, Maldon sea salt and fresh ground black pepper and topped with a basil chiffonade. Everything was ready to go to be plated well before guests arrived. 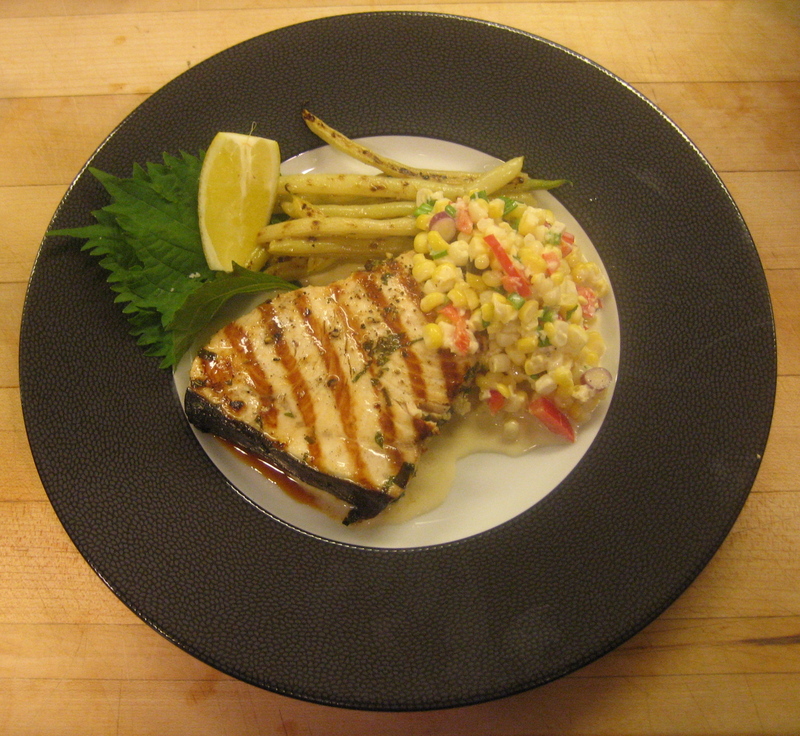 I had grilled fresh swordfish earlier in the week for Christina and she lobbied to have it again for our guests. Given my failure to locate duck or lamb or pork on my drive, I went for the swordfish. It was marinated in a little garlic, shredded shiso — a minty, grassy herb that I got from Z Farm and olive oil. It was grilled in my grill pan — good as any you would get off a backyard grill. Served with a properly trimmed lemon wedge. There is a similar recipe on page 198 in At Home. I decided to grill the yellow wax beans. Just lightly tossed in olive oil and grill. Here a grill pan is much better than an open grill as there is no place for the beans to fall. The grilling adds a dimension to the otherwise very simple beans. See At Home page 307 for Grilled Green Beans. And what’s the purpose of a summer’s dinner but for an excuse to eat corn. Here it’s shaved with just a little sweet red pepper for color and purple scallion. What was unusual about this corn salad is that I had some leftover home-made mayonnaise from the deviled eggs and felt that the plate could use something creamy so I dressed the corn salad in the mayonnaise. It was sweet and creamy with a little bite from the scallion. One does not frequently see a corn salad with a creamy dressing. We served the J.Maki Viognier with dinner. Like the champagne, it was also excellent. If you are not familiar with Viognier’s — a varietal grape that typically not bone dry and with tropical fruit overtones. At Home owners check-out the wine chart on page 32. 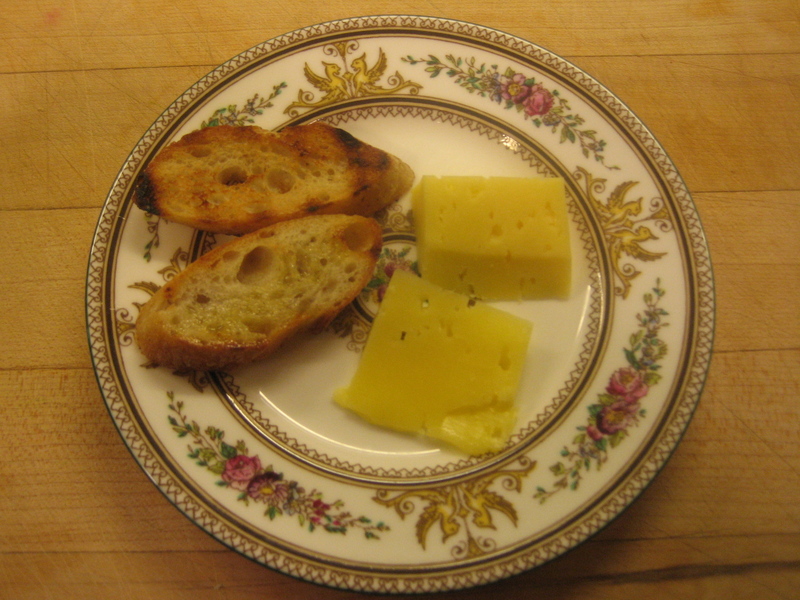 Rather than a full blown and filling cheese course added to an already ample meal, I served just a little bit of a Toma Primavera from Lawrenceville, NJ’s Cherry Grove Farm. I would put this cheese up there with the world’s best cheeses. It is available at the Rittenhouse Square Farmer’s Market. It’s served with a little grilled bread. Weaver’s peaches were ripe, sweet, spectacular and easy to handle freestones. I made a peach sorbet by simply pureeing a mix or yellow and white peaches — skin and all – them passing the puree through a strainer to remove the larger pieces of skin — adding a ginger-scented simple syrup and then freezing in my ice cream freezer. It is important to “temper” sorbet or ice cream before serving. That means removing it from the freezer so it has a chance to soften somewhat. 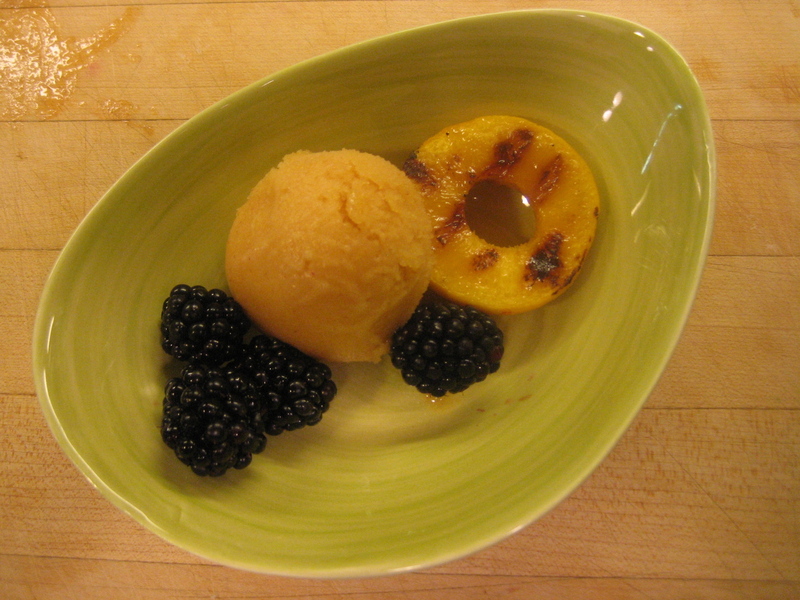 The peach sorbet was served with a grilled half of a yellow doughnut peach. I used an apple corer to get the pit out while accenting the “doughnut.” These were brushed with honey from Jack’s Farm Stand of two weeks ago and olive oil and grilled. Blackberries provided a color and slightly sour counterpoint. I always counsel that the ideal is to begin planning a weekend dinner at least the weekend before and spread your tasks over time. My current schedule isn’t allowing me to do this, but here’s how I would approach this meal if I were you. The sorbet and roast marinated peppers the weekend before. (Be careful not to eat those wonderful peppers during the week!) 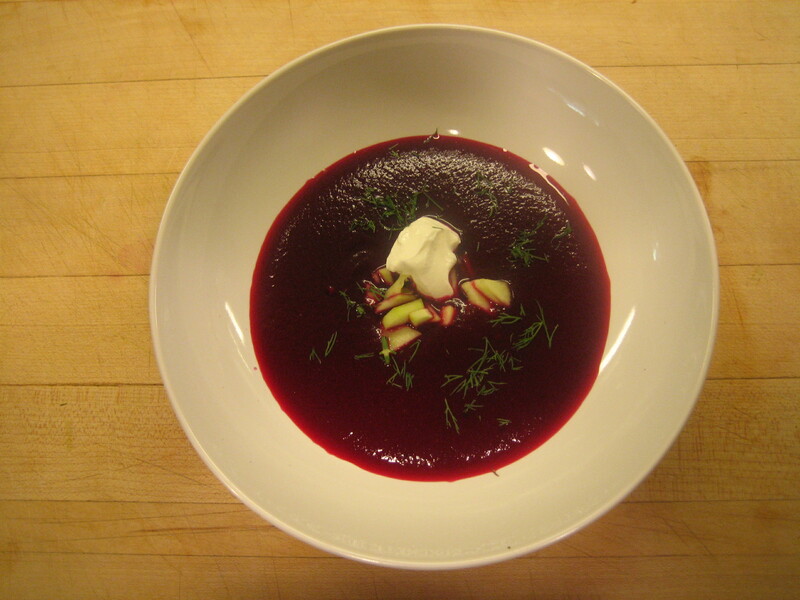 The cold beet soup early in the week. You can also make deviled eggs mid-week though I would not stuff them until Friday or Saturday. Shop on Thursday for everything else except the swordfish and scallops. On Friday, grill bread and store in air-tight bag, dice cucumbers and chop dill for soup, slice onions for tomato salad, rinse lettuce and store in damp towel, blanch yellow beans, make corn salad, chop garlic for swordfish marinade, make lemon wedges and remove pits from doughnut peaches. Friday also set the table and chill wine. That leaves for Saturday during the day, slice scallops, marinate swordfish, grill yellow beans, slice small tomatoes and make basil chiffonade. Grill doughnut peaches. Place hors d’oeuvres on platters or bowls. Make sure you give yourself one relaxed hour before guests arrive. If you follow this schedule that will be easy. To turn-out dinner: dress scallops, bowl and garnish soup, arrange and dress tomato salad, grill swordfish and plate entree, cut cheese and plate with grilled bread, plate sorbet with doughnut peach and peach sorbet. I am not suggesting this is no effort. Nor am I suggesting you try to repeat this exact meal — though I believe you could. What I am suggesting is that by planning ahead and spreading out your tasks, this can all be fun and not a chore — including the shopping. Note about vinegars: Balsamic vinegar has become ubiquitous — nearly the default vinegar. While I love the taste of balsamic, it is pronounced. Vinegar’s role is often to provide a simple acid counterpoint to richness and sweetness as in the case with this recipe rather than add pronouced flavor. In particular, I feel as though we have lost “respect” for the clear voice of red wine vinegar. Perhaps this is because inexpensive red wine vinegars tend to be harsh. I strongly suggest adding a quality red wine vinegar to your pantry and using it frequently. There is a world of wonderful vinegars to explore. To that end, see the ingredient note in At Home — A Glossary of Vinegars — on Page 137. 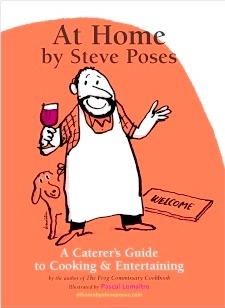 If you do not yet own At Home by Steve Poses: A Caterer’s Guide to Cooking & Entertaining, click here. 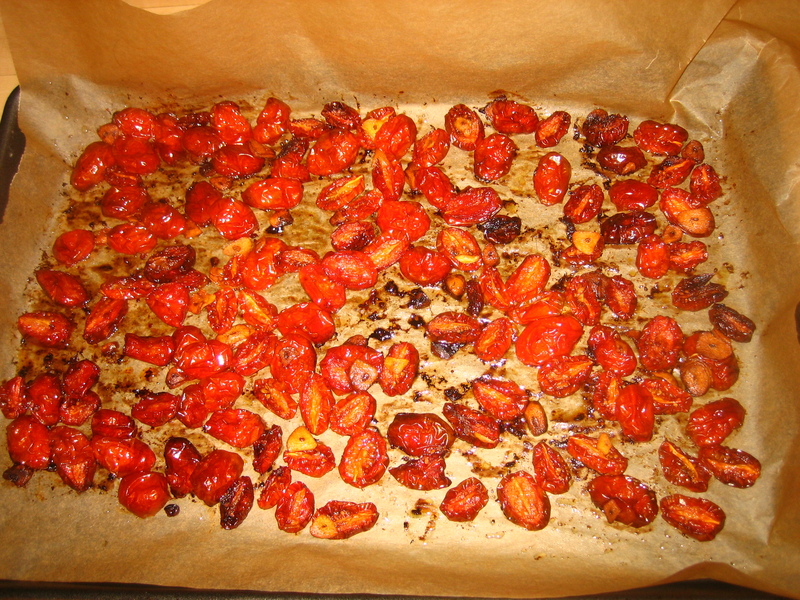 Slow roasted tomatoes are one of those ever-ready condiments, similar to roasted peppers. At Home provides a similar recipe on Page 82 using plum tomatoes as part of Crostinis and Toppings. 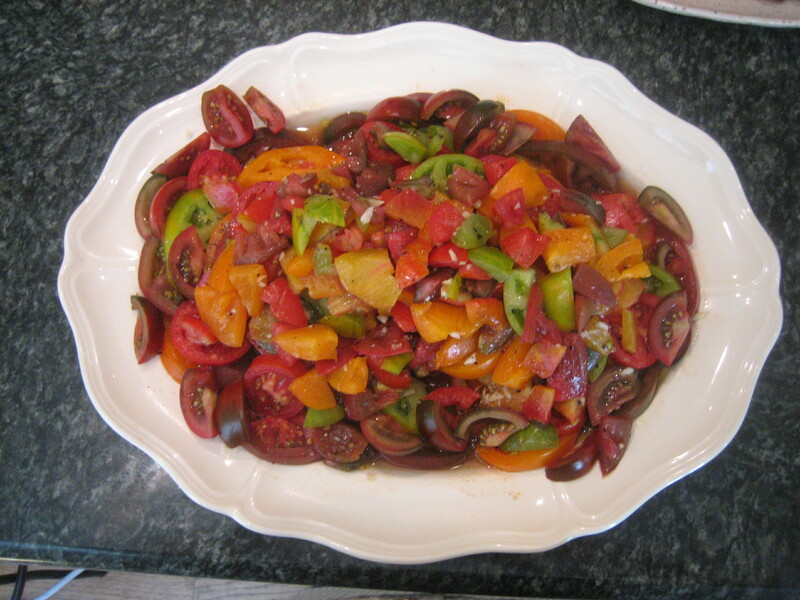 This is good winter’s version using grape tomatoes whose flavor is dependable year ‘round. The role of the vinegar here is to just slightly cut the richness of the oil and sweetness of tomatoes. The vinegar should just provide a slight undercurrent – hardly perceptible. Serve with crostini or just good rustic bread. 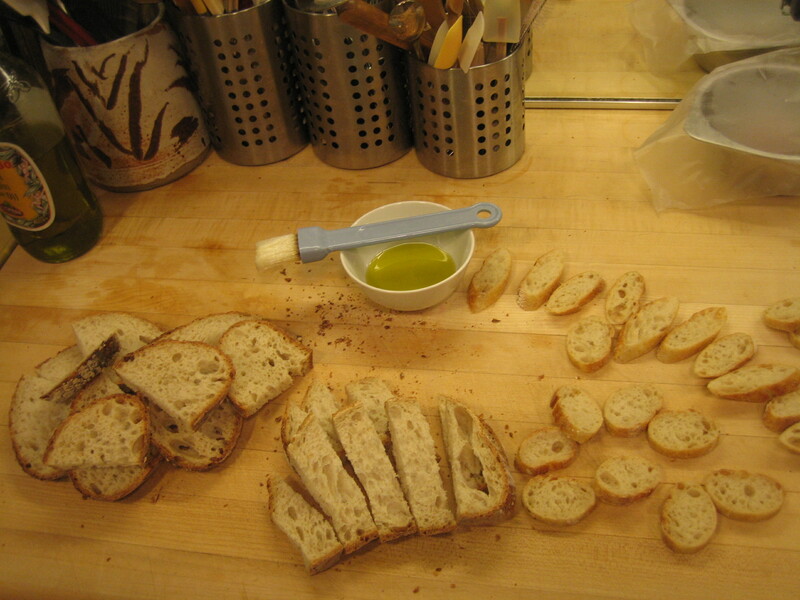 The addition of olive oil at the end provides some extra oil to “dress” the crostini. Do ahead Tomatoes may be made up to two weeks in advance and stored, covered, in your refrigerator. As with most foods, they are better served at room temperature than cold so remove at least one hour before serving. Making in advance also has the advantage of the flavors mellowing. 1. Pre-heat oven to 275 degrees. 2. 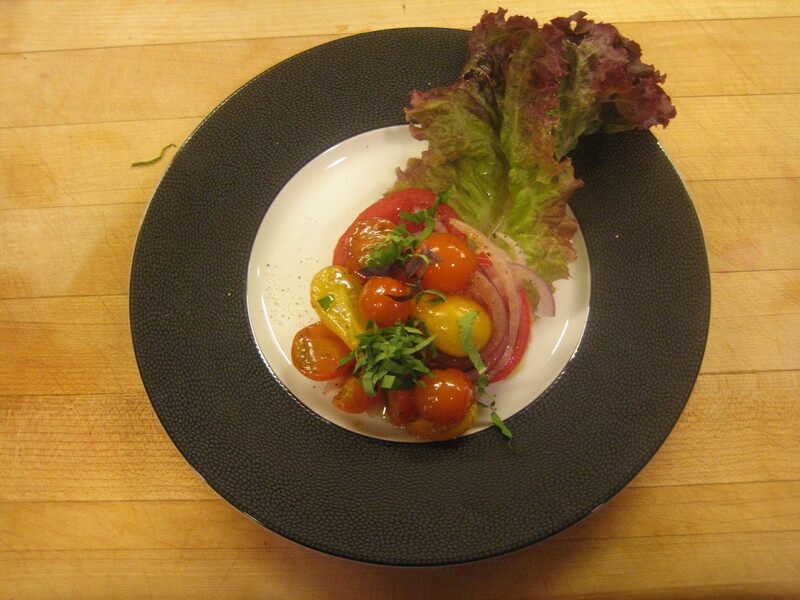 Slice grape tomatoes in half lengthwise. Combine in medium bowl with garlic and 3 tablespoons olive oil. 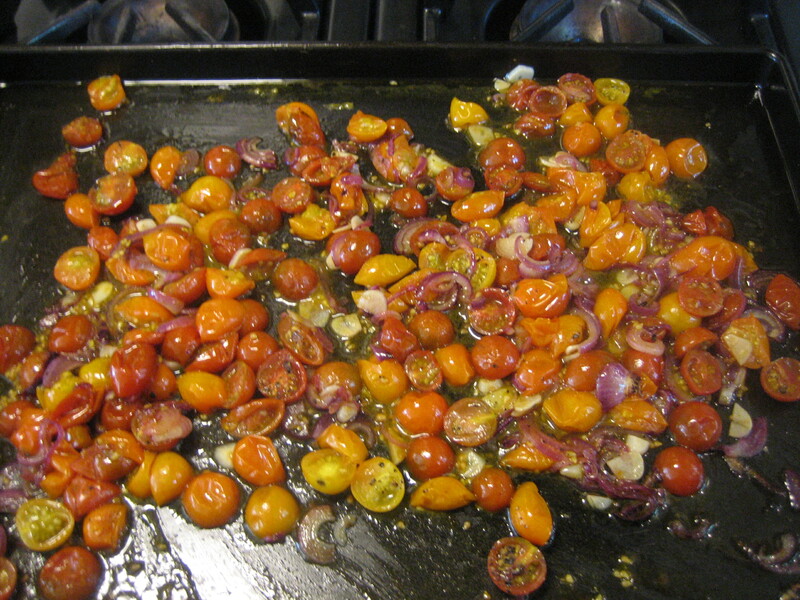 Spread tomatoes on non-stick or parchment lined rimmed cookie sheet. Place on middle shelf of oven. Roast for approximately 2 1/2 to 3 hours. 4. Allow to cool. Add 2 tablespoons olive oil, vinegar and salt. Mix well. Transfer to serving bowl. 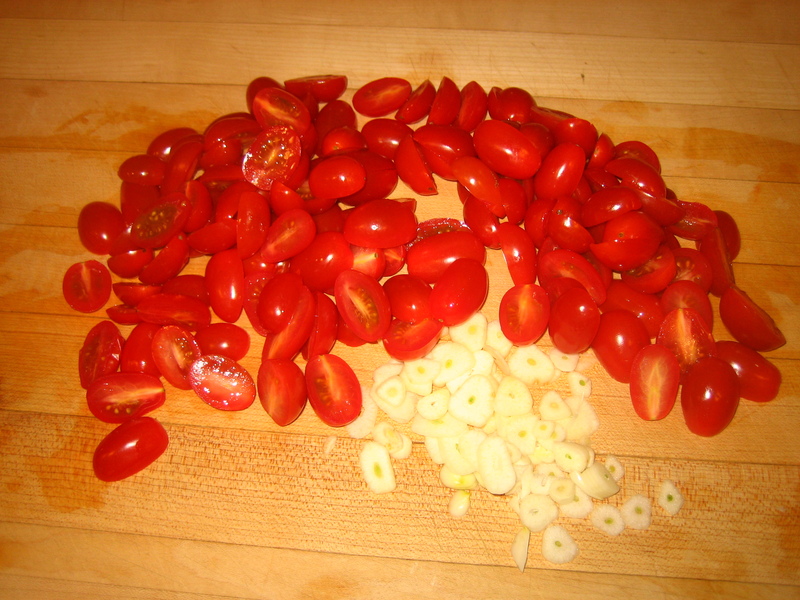 Cut grape tomatoes in half lenghtwise. 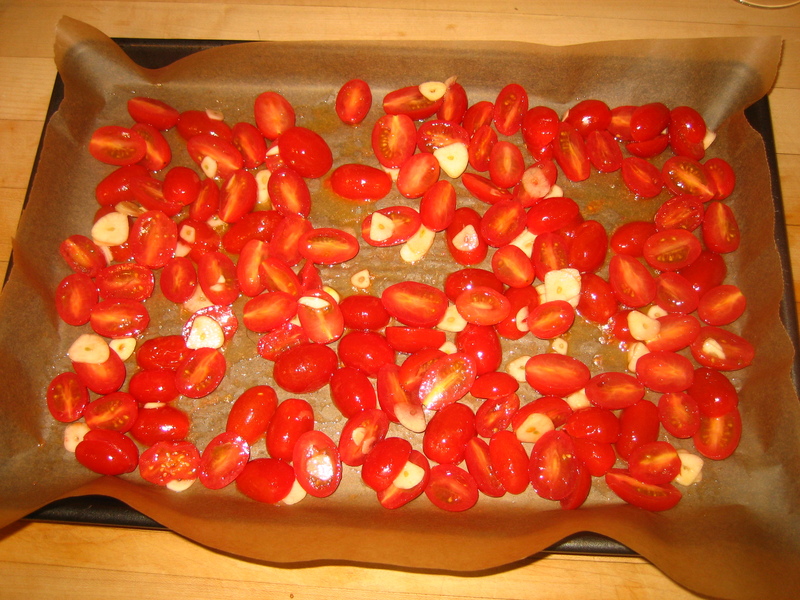 Spread tomatoes and garlic on rimmed cookie sheet. Don’t worry about whether the tomatoes face up or down. Depending on how they are facing they will cook differently, but that adds texture and interest to the finished product. I find the price of grape tomatoes varies from as much as $4.99 for organic grape tomatoes at Whole Foods to $2.99 or less at Sue’s — my little local produce store. To me, the flavor is the same. Be patient. Two and a half to three hours is a long time — a little more or a little less is no big deal. It helps to turn sheet mid-way through as ovens tend to not cook evenly. 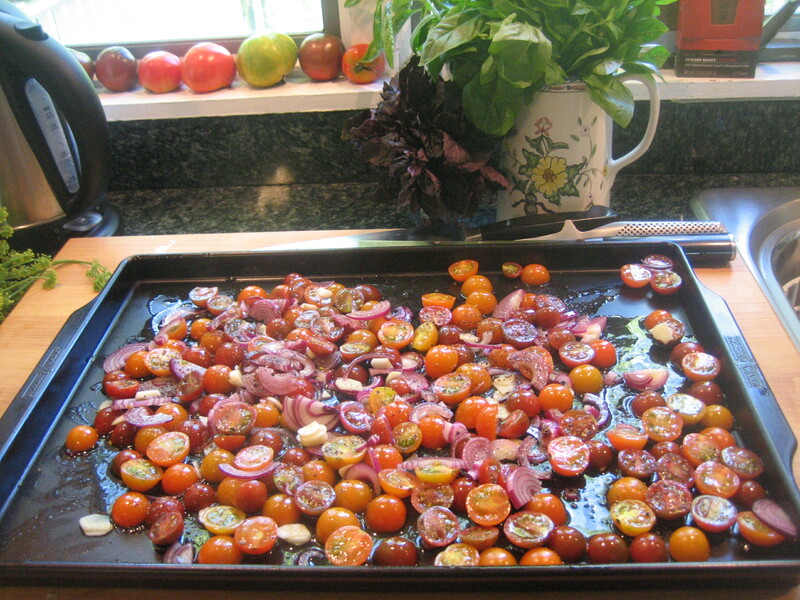 The roasted tomatoes should range from shriveled and nearly dried to still a little plump. They will continue to shrivel and shrink as they cool. 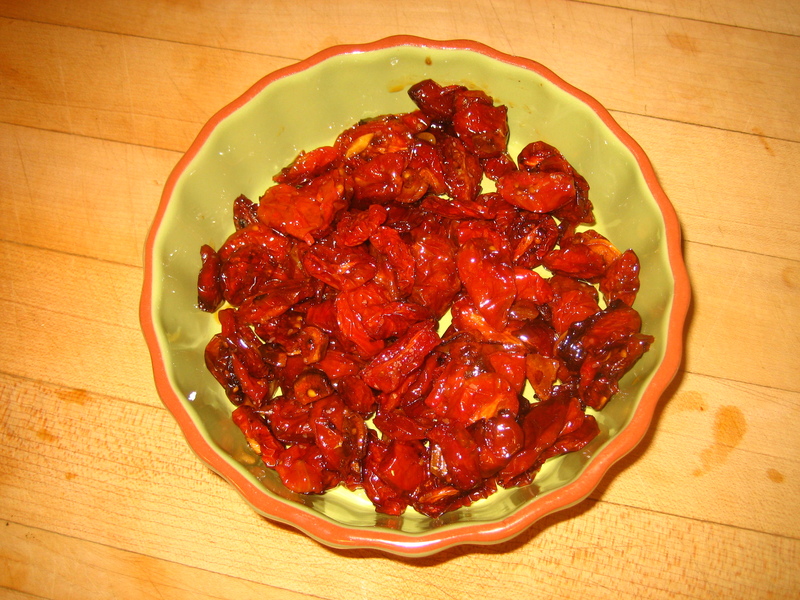 Longer cooking intensifies the flavor more, but you do not want these to reach the texture of “sun dried tomatoes.” You want a residue juiciness. Here’s the finished product. 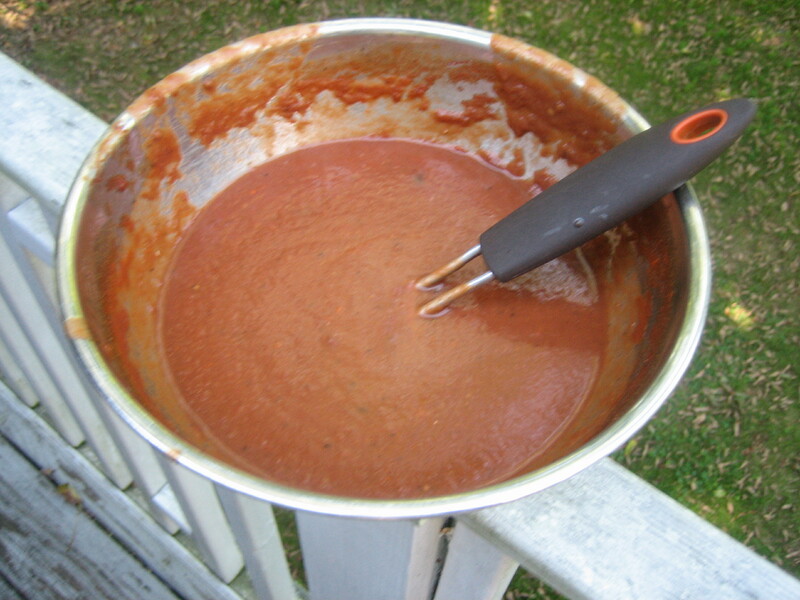 Two pints of tomatoes cook down to about 1 1/2 intensely flavored cups. You could add some diced fresh basil. Serve with crostini or just sliced high-quality rustic bread like I get at my neighborhood Metropolitan Bakery. If you are making these into topped crostini on a platter for your guests, dress it up with a little crumbled feta or good shaved parmesan. The response to my Goodnight Izzy post was been very warm and comforting. Comments have been posted on the blog. If you missed the post or want to see the comments, click here. 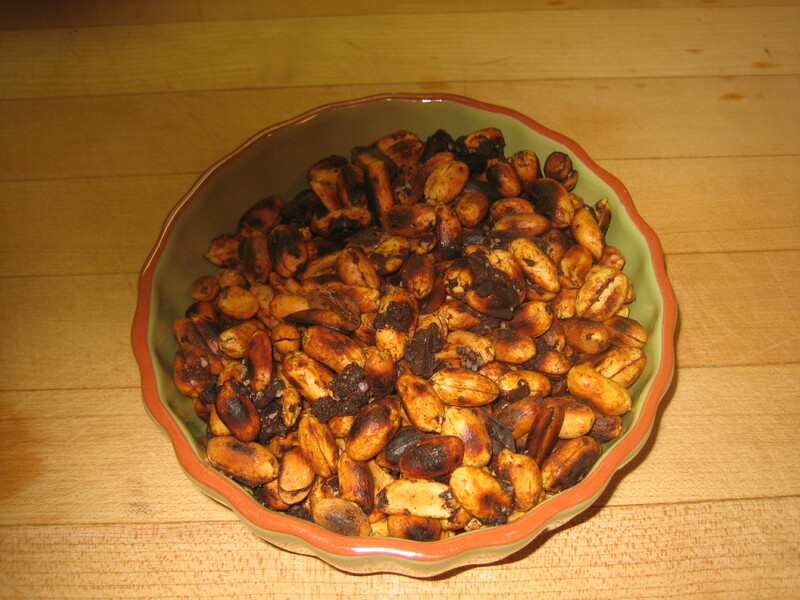 Jerk is a fiery-sweet Jamaican spice blend and it marries well with peanuts. You can use equal amounts of pre-ground spices if you don’t have a spice grinder. Do ahead Peanuts can be made up to five days ahead and stored in an airtight container at room temperature. 1 In a dry, medium sauté pan over moderate heat, toast allspice, peppercorns, cinnamon, paprika, cayenne and thyme until the spices release their fragrance, about 1 minute. Allow to cool. Transfer to spice grinder and grind until fine. Add sugar and set aside. 2 In a medium sauté pan over moderately high heat, heat oil until almost smoking. 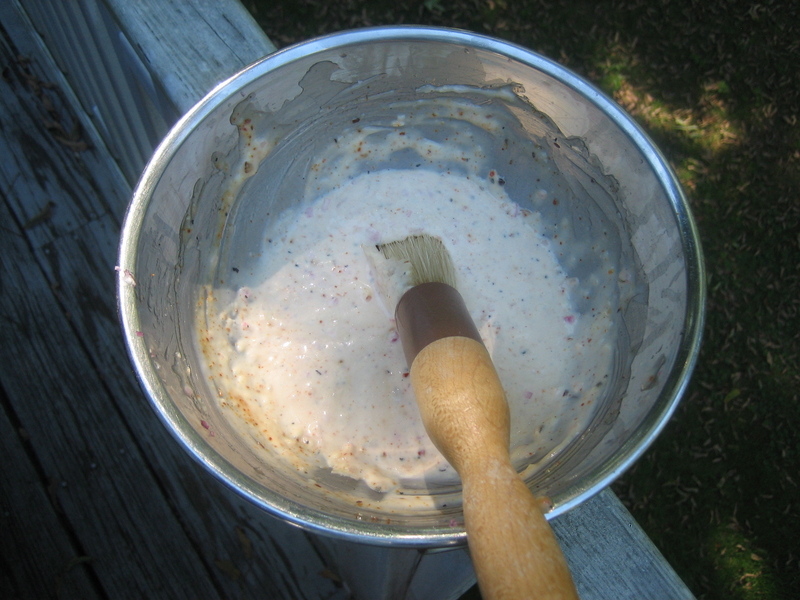 Add peanuts and toss continually until they begin to lightly brown, about 3-4 minutes. Add spice-sugar mixture and continue tossing for another 2 minutes to allow the sugar to caramelize and coat the nuts. Immediately transfer nuts to a plate or cookie sheet and allow nuts to cool. 3 Transfer nuts to a bowl and toss with salt.